A quick breakfast run to Public 41 (in Adelaide) for croissants and pack up for taxi ride to airport. Flight to Brisbane on time and full with taxi ride into town on arrival over A$50. Hotel Mantra Southbank is a modern building that the Kiwi taxi driver was not overly familiar with but which was quite easy to find. Lunch on the great area that is Southbank with it’s cafes, walking passages and general liveliness. 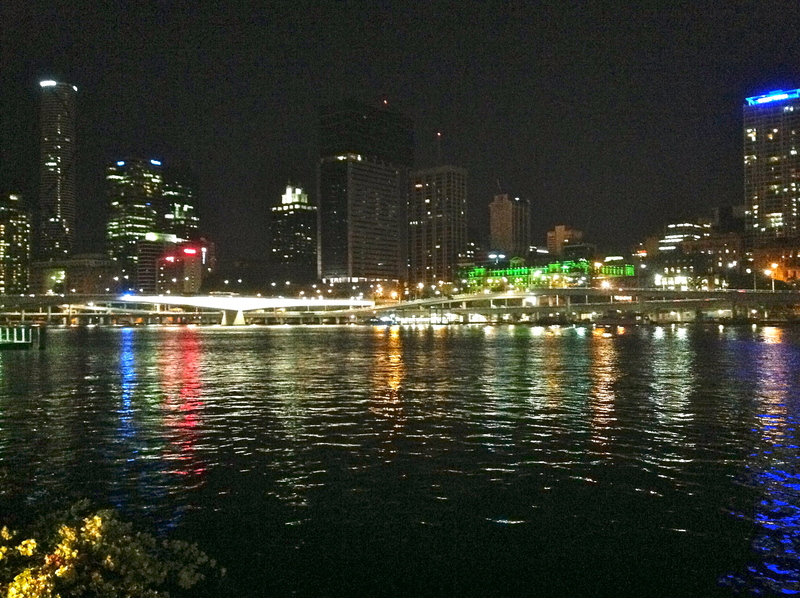 View Brisbane from across the river, what a shame the low skyline has been ruined by the motorways though. Quinten and his wife Angela had invited us out for a meal at their house and Q picks us up spot on the agreed time. A lovely meal followed by coffee on the terrace and lots of chats about our time in Jersey. 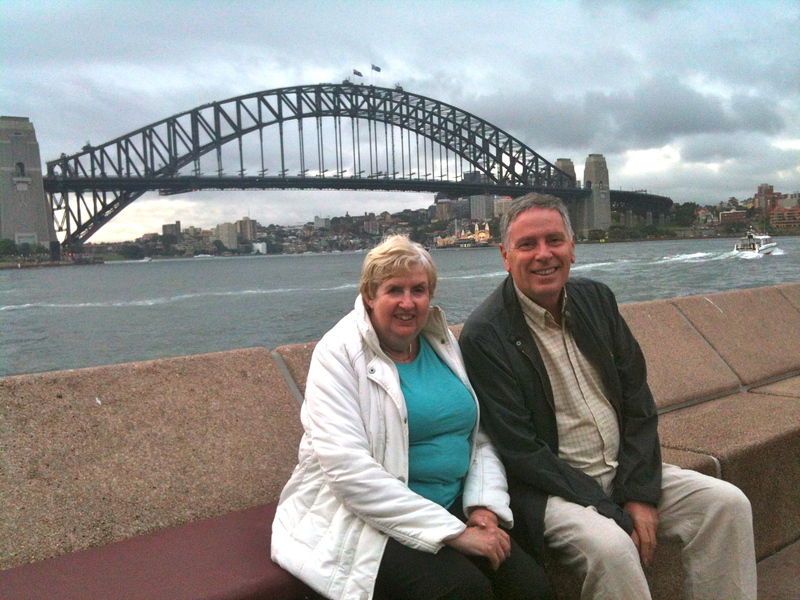 Q and Angela have led a varied life with work in London, Jersey, Solomon Islands and now Brisbane. Their son, Sebastian, is a member of “The Ten Tenors” presently touring in the USA. His daughter is also a musician, signing jazz in Melbourne. It was absolutely lovely sitting outside in the evening watching a few possums in the garden, one of which was pregnant. Driven back to hotel just after midnight with the sound of a few trains still evident outside our window. After breakfast, Q and Angela picked us up and took us to the Three monkeys Coffee House and restaurant for morning coffee. Deserted when we arrive, it was absolutely packed by the time we leave and head for a Saturday market at West End. Stalls set out around a sports pitch meant that you just had to walk round to view everything. Produce, jewellery, wooden plates etc. 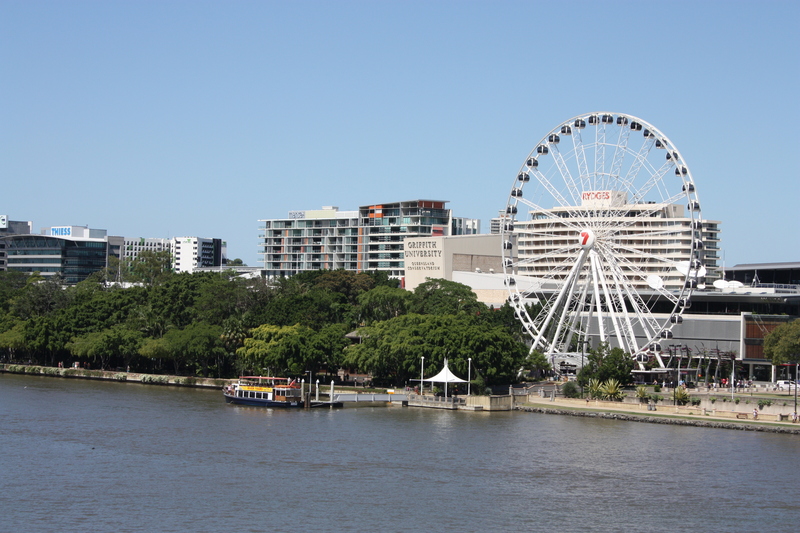 A drive around some of the centre of Brisbane before being taken to the Westfield shopping centre at Carindale (near Morningside which is where Q & Angela live) where we are left for a bit of retail therapy as Q and Angela had a prior engagement. Catch bus back to Hotel Mantra, rest and evening meal at The Sangria Bar at Ole Restaurant opposite from the hotel. Very noisy and vibrant and a good meal next to a couple of girls going to see Bill Bryson later – should have tried to get tickets, he is a good writer. Walk down to riverside for some night photos with a lot of people waiting for the ferries across to the other side of town. Wander over to local market after a good breakfast (why can’t all hotels serve poached eggs that keep runny?) and then Richard goes accross river to collect car. A bit of a wait whilst others are served and back over river to collect Sal and luggage. Take roads south to join crowded M1 which turns into M3 and four lanes of slow moving traffic in 35C heat. Stop for an iced coffee at The Coffee Club @ Homeworld Helensvale, QLD – probably the best iced coffee I have had and a meal in itself. Back on motorway, slow to about 20km/h for about 10k before it thins out and the scenery turns from industrial to bush and trees before we reach the turn off for Byron Bay. Poor instructions and lack of evidence of street names again and we go into town before retracing our steps to find Motel. A A$100 deposit is required which is not really appreciated but they do have complimentary washing and tumble drying but no free Internet access. We could have bought internet access but hope we can find some in town. 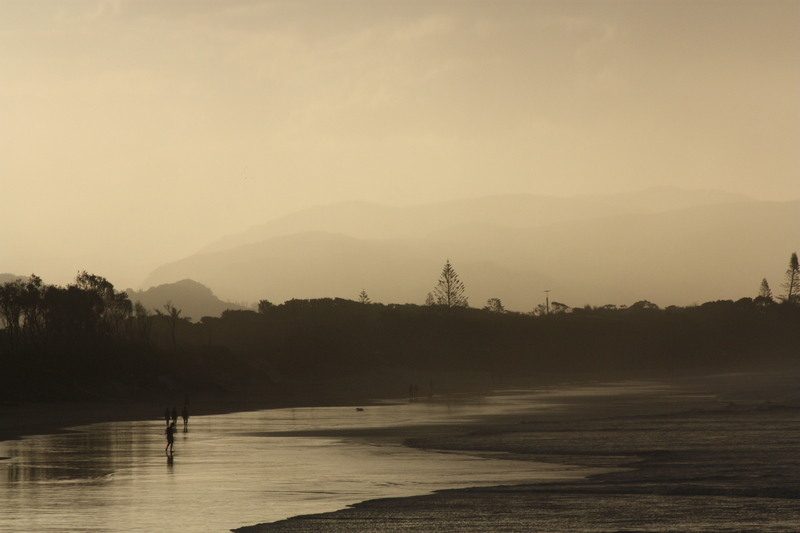 Dinner in Fishheads on the sea front in Byron Bay, the most Easterly town in Australia. Excellent steak washed down with local Stone Wood beer followed by a walk on the beach and some photo taking as the sky and sea were both pretty angry pre storm. What a storm we later had, thunder lightening and torrential rain, it was surprising we didn’t have a black out. Charm offensive by a young girl in asking me if I had a lens cloth for her camera – she had to do with my polo shirt instead, still the views were lovely. Usual Sunday night helping of Rake and Wallander on TV, probably the only decent night TV is on but winds high with noise from sea quite loud in our apartment. No meals provided here as it is a really basic Motel type accommodation where you even have to make your own bed! Off to breakfast at Balcony and some Internet access and a chance to get up to date with the world, the first time since Adelaide last Friday morning. Try to get to the lighthouse but despite the parking being $7 (we didn’t pay) there was nowhere to park so we left – the views would be stunning though. 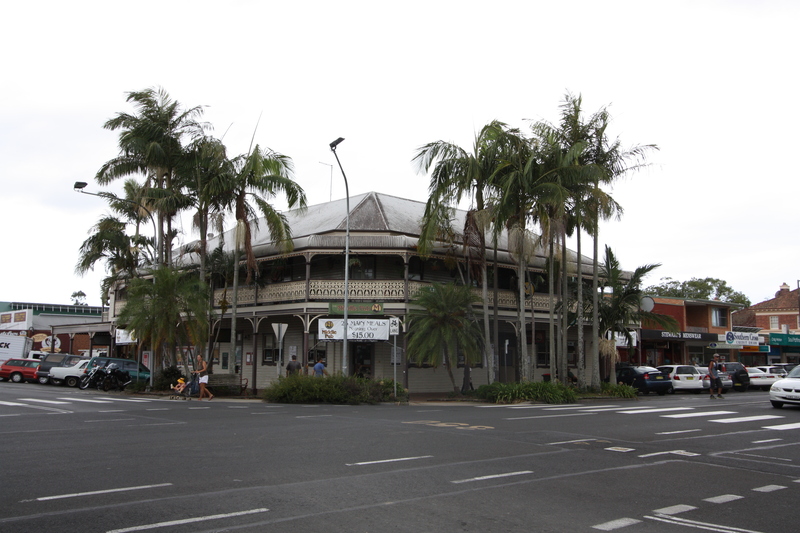 Headed off instead to Bangalow and stopping for lunch at Mullumbimby, a sleepy town. All the area around here is “hippy” type country so the styles of clothing and are outrageous but the views from the route are quite stunning, some like English countryside. Boat tour tonight up the nearby Brunswick River. 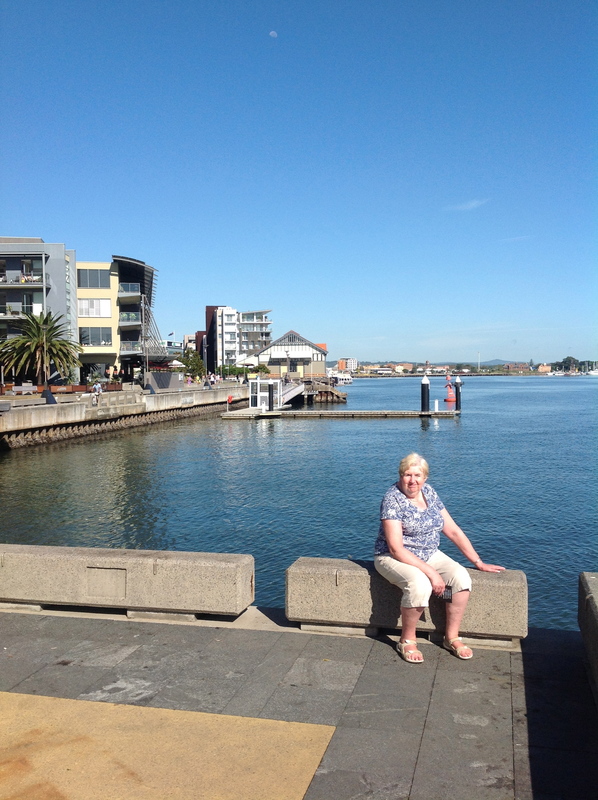 At Brunswick harbour head for River after picking up 4 other people. Ride out to see the “most dangerous” harbour entrance in Australia with no protection and a sand bar. Head up stream, passing wildlife, trees clinging to the water’s edge whilst sipping XXXX and wine and eating nibbles, all for $30 each. 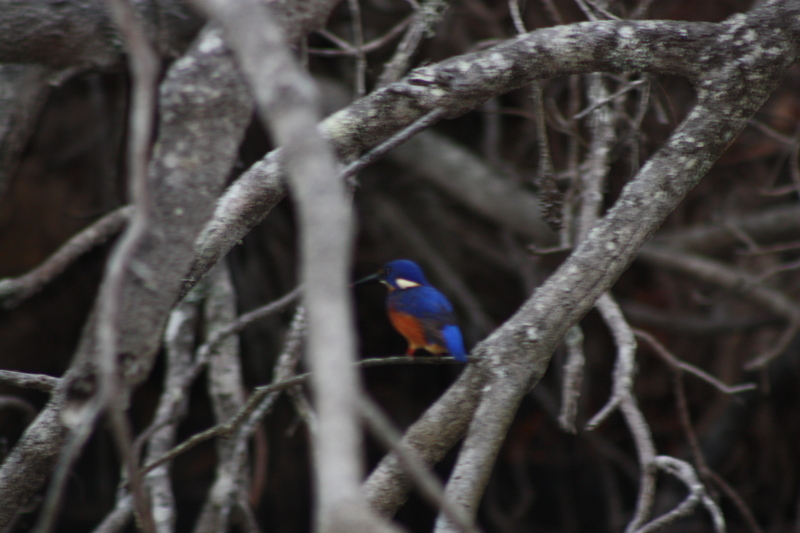 Highlight was a kingfisher and a sting-ray. Fish and chips by the Pacific Ocean listening to the waves and watching the full moon rise. Not so much wind today so sea not so loud from our apartment as last night. Drive up to lighthouse for panoramic view of bays both north and south watching the Rosellas (parrotts) and butterflys nibbling at the tree blossom before buying breakfast on the go. Ring Lilly Pilly as requested for tonight’s accommodation and say we will be there at about 5pm, about 6 hours time for a four hour journey. 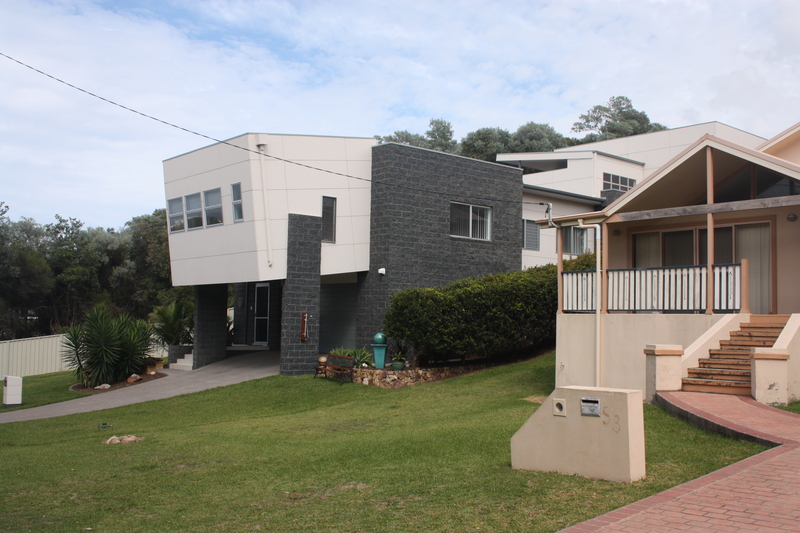 The next township South, Lennox Head, is much more civilised than Byron Bay and spot what could be a nice appartment for a longer stay. 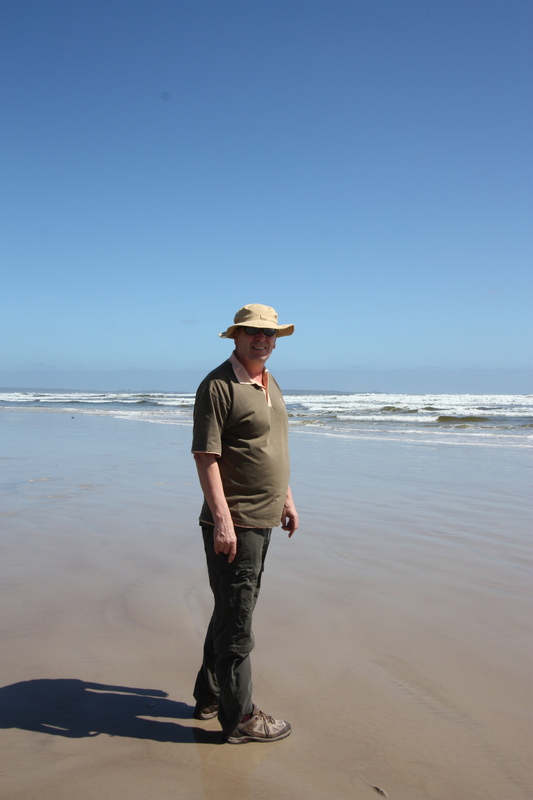 So many nice beaches along this coast and virtually all for surfers but not crowded. At Belina, spot a shoe warehouse open to the public attracts our attention and we come out A$150 lighter for a pair of UGG boots for Mel and sandals for Sal. Onwards to Grafton, but not knowing where the antique type shops were find a shopping centre for lunch but no time to look around as we have to get to Lily Pily by about 5pm – we were eventually about 25 minutes late. Sad news from looking at emails, Tony Fulford, G & S member, has died after a 7 week illness (cancer). Such a sad loss and has cast a shadow over today. There are so many roadworks on the way reducing our speed from 110 to 80 or 60 and even 40 at one stage. Scenery varied but mostly wooded and weather very hot so once again, the travel time taken was. Lily Pily is a lovely place and we are the only guests. In fact, Jeanneatte and Bruce have already asked Audley to only book guests for a minimum of two nights so it is a shame we are only staying one night. Fantastic view from the cabin overlooking the valley full of trees and the river at the bottom of the valley. Nearest neighbours about 500 yds away and next ones probably about 2 miles away. Back down to town and at Bruce’s suggestion, go to 5 Church Street for an evening meal followed by a viewing of the Fruit bats circling around before going into the trees at dusk. We have the sitting room to ourselves of course and have some Port, courtesy of Lily Pily although decline Bruce’s offer of a hot drink before we are off to bed. Breakfast on the verandah and a Skype with Flic, doing wellish after her operation. 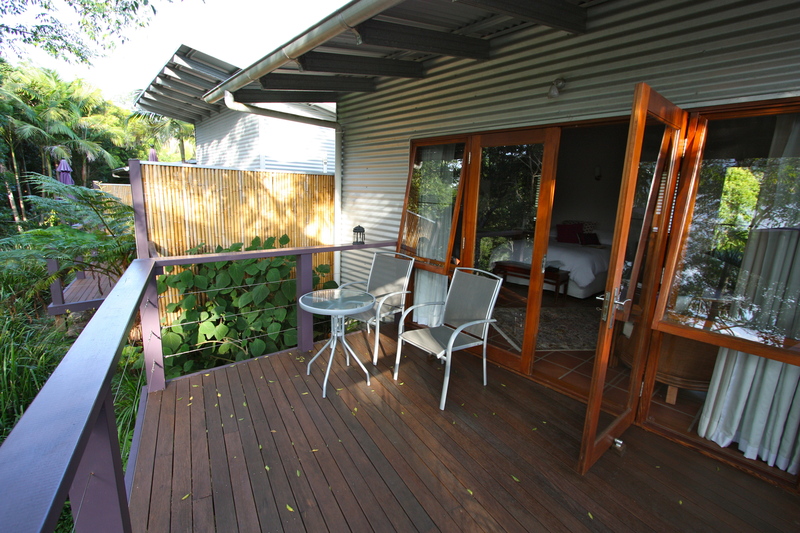 We say our goodbye’s to a lovely room and guest house after a very good breakfast and on Bruce’s suggestion, head for Urunga and walk the boardwalk for 1k each way – a good suggestion but not on Audley’s suggestion list. Drive on, only stopping at Port Macquarie for lunch, again through loads of roadworks which considerably slow us down. Our instructions were to turn left off the Pacific Highway at Morpeth but as we found, Morpeth is not on the PH so we missed the turn and had to do 2 sides of a triangle. 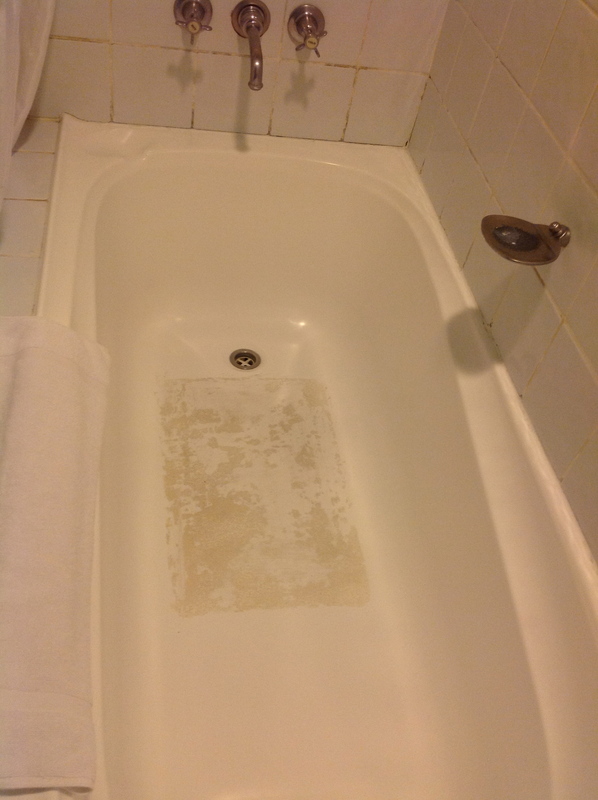 The Anchorage looked on paper a first class hotel but the room we get is far from First Class with a peeling non slip film in the bath and dirty grouting in a room that has certainly seen better days. Even our replacement room has some antiquated 1970s furniture, carpets not fitting properly and no room guide. Internet costs A$30 for a couple of days, extortionate and therefore not used. This hotel has a great view over the harbour but the refurbishment can’t come quick enough. A hotel that provides powdered coffee, no coffee percolator and hard toilet paper in no way can be classified as “First Class”. Mind you, the food in the restaurant was generally good, albeit the service slow. Nuts were mentioned on the menu as being in all but one of the deserts but the one that did not mention nuts came with, yes, nuts on top. Do they not have nut allergies in Australia? The Anchorage certainly needs to get it’s act together. Slept well last night after a long drive in the heat. A lazy day is called for especially as the kayaking tour mentioned as an option is not going to happen (it only happens at the weekends at this time of year) so we opt for a coffee and an email catch up at a local coffee shop and a paddle in the sea before the heavens open for about an hour. 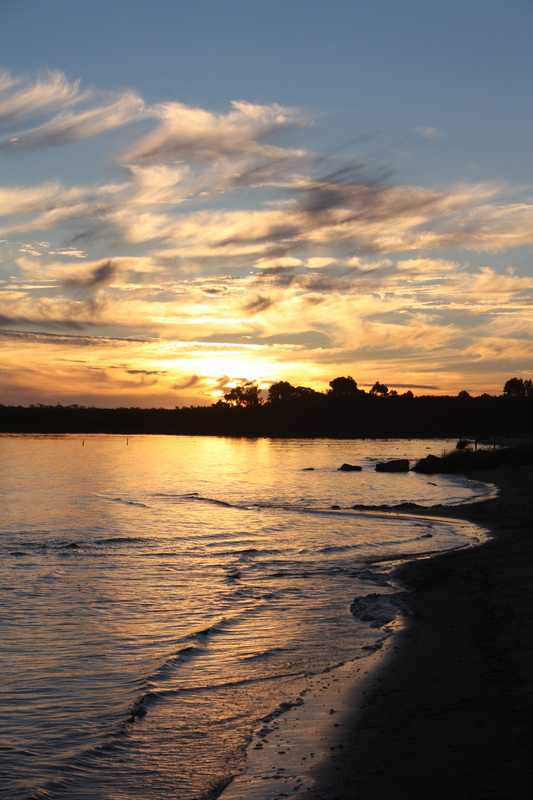 More bays, more beaches, some Pelicans following fishermen, some different style houses to see and back to the hotel for a chill out and swim followed by dinner in the sleepy nearby town of Port Nelson as another meal in the slow service hotel is not really required. Back to our room only to find a cockroach lingering in the sink area. No chance to catch or get a photo of it as it scurries under the sink area and away. Hopefully it won’t return overnight. I do not like this hotel at all. Brown deposits in the bath this morning which were similar to something Richard found the morning before but which had been dismissed as just poor cleaning. This is certainly not poor cleaning but could either be from the ceiling or animal created. On check-out cockroach is described to the staff who dismiss it with a comment “they are supposed to spray”. It is highly probable then that the brown liquid deposits were from the cockroaches. It is such a shame as this is in is lovely location, the public areas including the pool are fine, the staff friendly and the food is what you would expect from a hotel. The room decor etc. let’s it down badly. As I said, the refurbishment can’t come quick enough. Having sampled a wine tour in the Napa Valley (California) a few years ago we knew what to expect in the Hunter Valley but of course with only three more nights in Australia would be very restricted in what we bought as we would not be able to take any back on the plane so had opted for a stay in Newcastle rather than (as Audley suggested) the Hunter Valley. 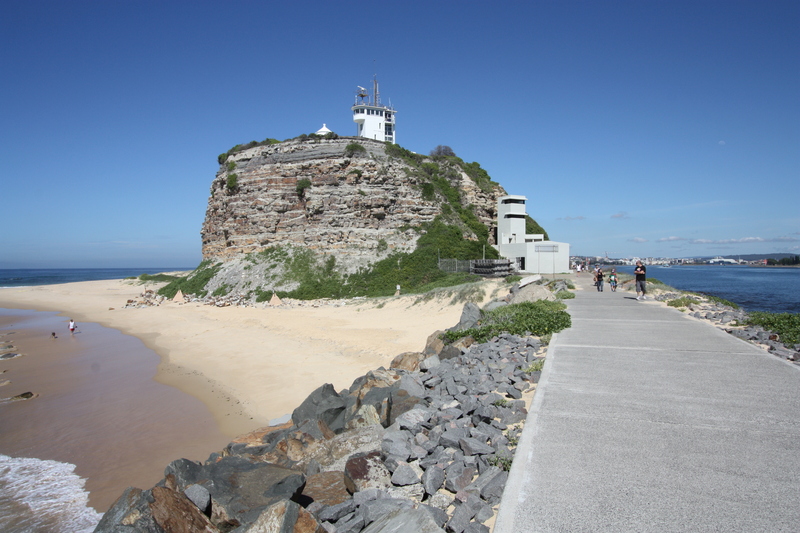 Newcastle is only a short journey down the Pacific Highway so meander in the direction of Australia’s East coast port which Lonely Planet named in 2011 as one of the top 10 cities to visit. Stop at lots of bays on the way for photos but also some of the grand design houses that have sprung up. Reach Crowne Plaza Newcastle at about 1pm and are able to check in which is good as it then gives us time to explore the area. Lunch in The Dockyard on the boardwalk, an area converted from old dock workings and now a lively mini South Bank Brisbane type area. The area is now called Honeysuckle and is worth a visit. Walk towards Nobby’s head but only get to ferry crossing point and Richard explores town whilst Sally waits and watches the world go by and the ferry crossing to the other side. Clothes shops are typically quirky and there are more than there fair share of book shops. Dinner in hotel was memorable for the supply of Bubble Gum Ice Cream in a desert; weird. What was good though was a live musician playing Jack Johnson type music. Good night’s sleep, no cockroaches but awake at 7am by fog horns; it is foggy on the Tyne, sorry Hunter river. Breakfast in nearby McGourty’s though two of the four items requested were delivered wrong! Nothing wrong with the food we had though and considerably cheaper than a breakfast at the Crowne Plaza. 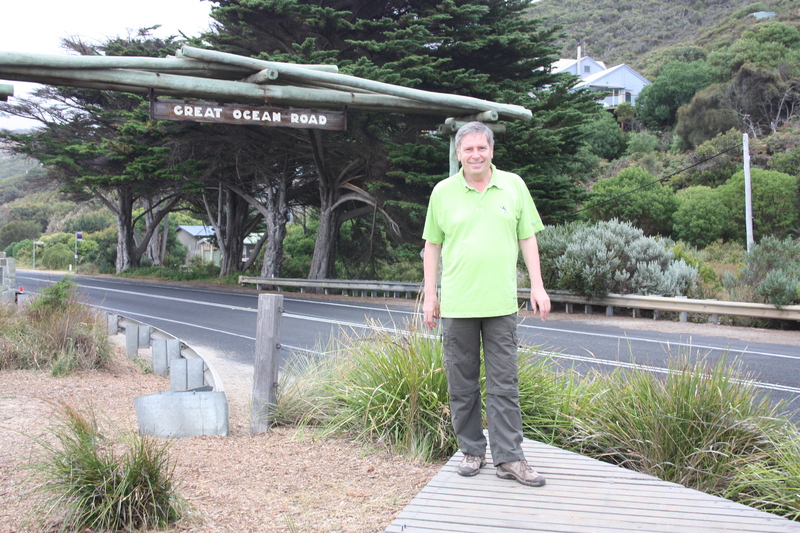 Check out and drive towards Nobby’s Head. Walk partway along the breakwater watching all the surfers and head off on the Pacific Highway and Motorway towards Leura, passing the outskirts of Sydney and then heading for Windsor and Penrith before the mountains start slowing our journey with the winding road. The heavens open with an almighty hail and thunder storm shortly before Leura so we turn off and park up for 5 minutes or so before it subsides. Find Buttercup cottage which was somewhat of a surprising establishment, especially after the Crowne Plaza last night. A very rustic cottage built using recycled materials but probably could have done with coats of paint to brighten up the decor. It appears to be “shabby chic” with an emphasis on “shabby” rather than “chic”. Out to Leura village centre, drive around to Toy Museum, it was already closed for the night, and a brief drive up road to Katoomba which looks bigger. Back in Leura, buy bread and yoghurts for the two days and then dinner in Bon Ton. We are supposed to have Internet access but it does not appear to work! 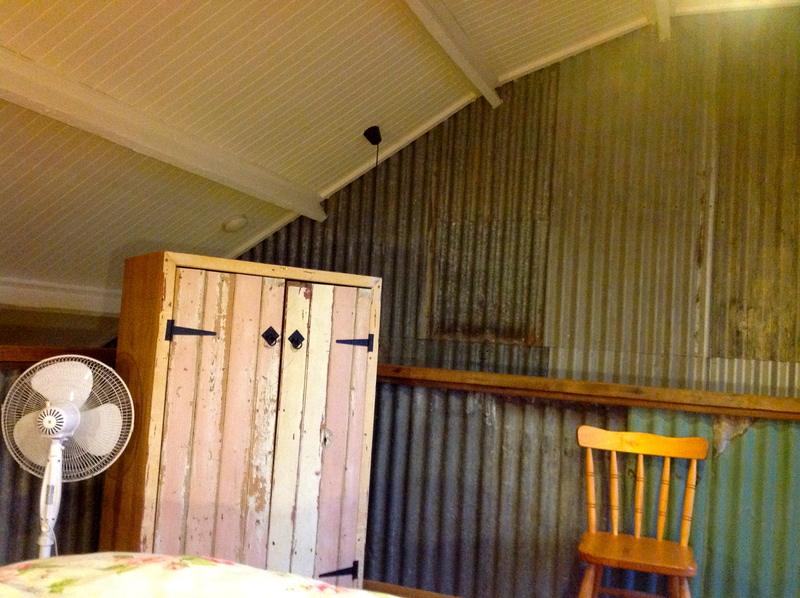 Not sure I’ve ever slept in a room with corrugated iron as a wall but a good night’s sleep was had and no dawn chorus, surprising. Breakfast on the patio with the sun streaming down on us after a misty start. 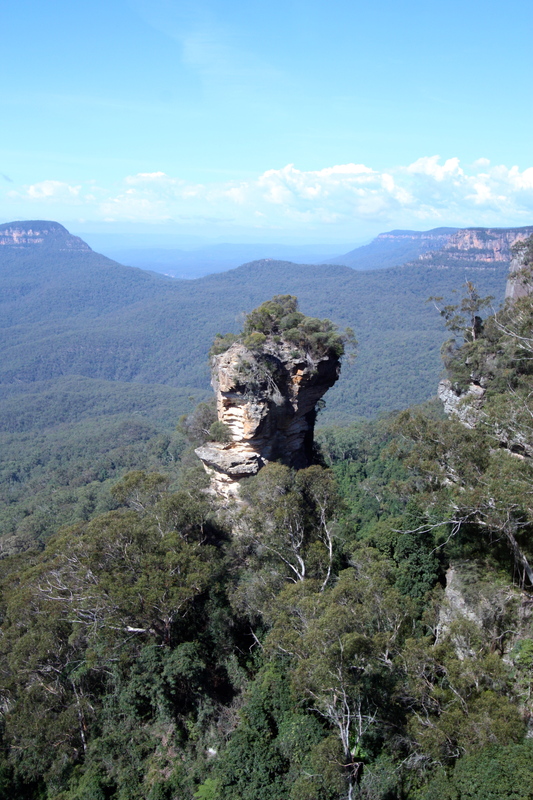 Trip advisor comments suggest that Scenic World gets crowded pretty quickly so go early to avoid the crowds. Entrance fee of $64 between us doesn’t seem too bad and we are supplied with arm bands to gain access, or exit, from the three “rides”. The main “attraction” is the three sisters although for a good photo opportunity the morning is not the best of times to go as the sun is directly in front of you. Firstly, a very steep train ride, reputedly the steepest in the world, followed by a walk around the boardwalk at the bottom and a cable car ride to the top. 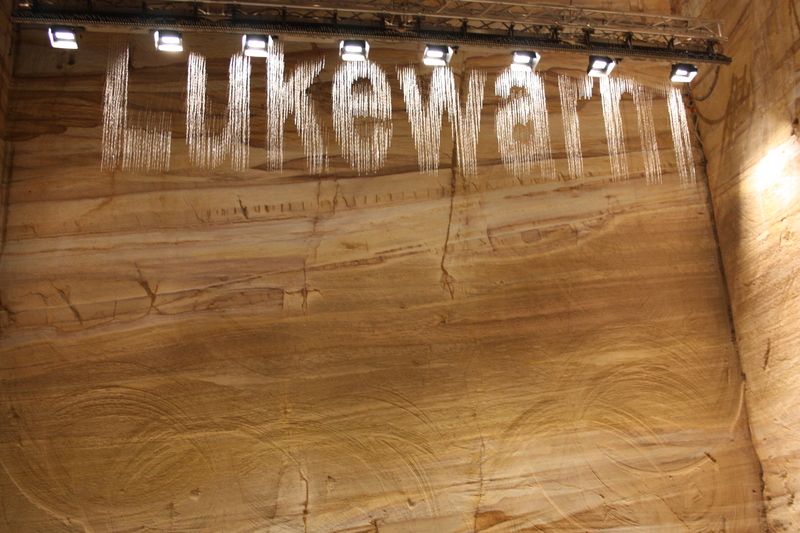 Fill up on a few souvenirs and then take the Skyway across in from of the Katoomba waterfalls. The lookout point wasn’t as mobbed as it probably will be later as we have to wait over 10 minutes to get the Skyway back by which time the queue was probably another 50 or so strong behind us. This is a tourist attraction taking advantage of nature. As one reviewer on tripadvisor put it, “go for a hike”, you see more. Back to the thriving town that is Leura for lunch, drop food for dinner at lodge, try to get on Internet at lodge and head for a drive around the area to Lithgow, the fire damaged Zig-Zag railway and a viewpoint before heading back to pack the bags ready for tomorrow’s last journey back to Sydney. Last Sunday in Australia, so it must be time for Rake, Waking the Dead and Wallender! 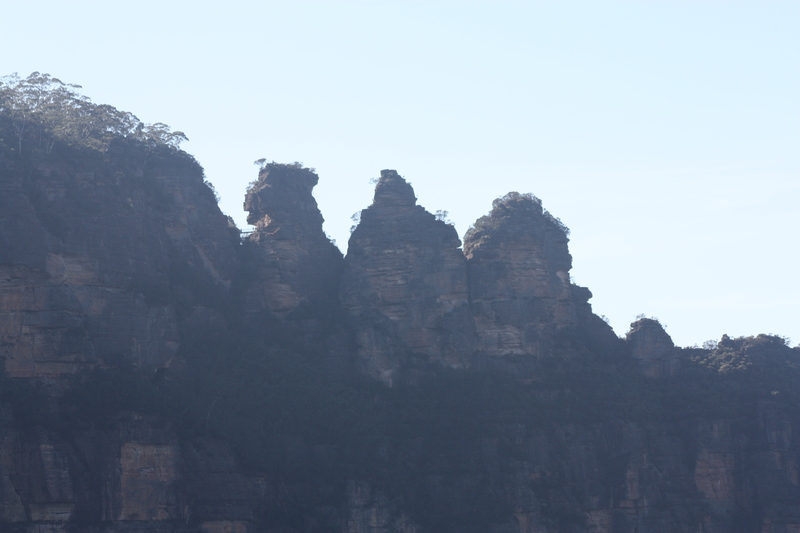 Our last full day in Australia and no dawn chorus to wake us up in the Blue Mountains, just rain. It certainly knows how to rain here, not surprising I suppose as we are over 3000ft high and the temperature is now down to 13C. There was no one on reception throughout the weekend so it was the first chance we had to talk to the manager / owner just before we left. Whilst there was nothing wrong with the chalet / hut / barn, it just was not to our taste with a few black creepies around but we could see it would appeal to others. Leave around 10 still in pouring rain, goodness knows what we would have done if it had rained like this yesterday, and headed along the M4 motorway for Sydney. Quite heavy traffic and lots of it exceeding the speed limit. We were good but at least two drivers weren’t and probably suffered a heavy fine. Get complemented in a service station for reading a map rather relying on a sat nav, especially as instructions to get into Sydney a bit vague but fortunately, signposts were, for once, able to direct me to the centre. The itinerary instructions we had been provided with suggested we turn up Essex Street in Central Sydney, the trouble was Essex Street was not marked on the map so anyone arriving in Sydney for the first time might be confused. Leave Sal with bags in Hotel, much better one than the previous Sydney experience although still up a bit of a hill and return car to Hertz, walking back through the city for a quick rest before venturing out for final souvenirs. Massive rainstorm hits the city dropping the city temperatures from a muggy 24 to about 17. It is later understood that one person died by being washed into a storm drain and drowning. Back out for dinner at Opera House watching the cruise boat depart before settling down to watch The Magic Flute in the Opera House as our last night treat. Had been told it was sold out but far from it and our side two seats were adjacent to about 5 empty seats so we moved up into the more expensive seats, bargain. Wonderfully silly story, almost G & S like but with outstanding costumes and a cast of probably over 40. We were not supposed to take photos but being so near to the exit, we found it difficult to attempt unlike some others in the middle of the theatre. SOH was built in an age when it was assumed that everyone had full mobility so lifts are scarce but we do find one, followed by some escalators so only a few stairs to climb, fortunately. Years ago, people would dress up for theatre, be it Opera, plays or Musicals. Not now and all sorts of wearing apparel were present although thankfully not too many in Jeans and T shirts. Walk back to hotel along harbour front which by night does look impressive before settling in for the night, a quiet room although it is understood Friday to Sunday nights are noisy. Sal has a lovely call in the hotel from Barbara wishing us a safe journey and thanking us for the gift we sent, whilst Richard is collecting the takeaway coffee and croissants for breakfast. Pack up and off to airport courtesy of the Qantas chauffeur. Flight on time and we leave Sydney for the short hop to Melbourne. Have to change terminals in Melbourne and boy is that a long walk so we only get about 20 minutes in the lounge before our flight to Dubai and London in the A380 is called and we are whisked away for the 20+ hour flights. Sorry to go!! Must come back as I have 2 A$50 notes unspent! One of the advantages of flying business class is the shower on arrival evan at 5:30am. Showered and fed (again) we locate car and join the slow moving M25 traffic heading up country to Heysham and the ferry. Surprisingly not all that tired at the moment (no doubt that will come later) and relax for a smooth crossing back home to the mountain of paperwork, bills etc. Just as welll home has more than one toilet – the main bathroom toilet breaks about three hours after we get back! George and Richard are, we work out, 3rd cousins through Richard’s Paternal Grandmother and this is the first time we have met, George having “found” us on Genes Reunited a few years ago, ironically just after their return from a visit to his home town of Liverpool and which included a visit to the Isle of Man. 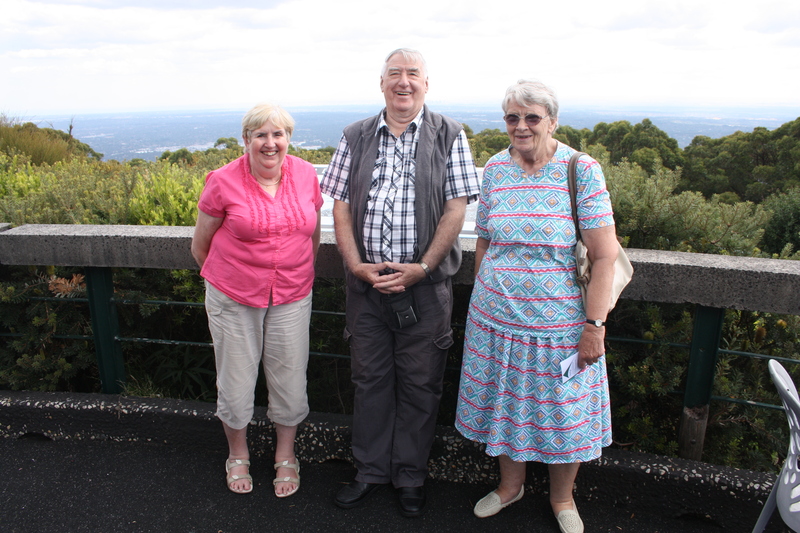 Lovely clear day and after breakfast we are taken off to the nearby Dandenong hills to the William Ricketts Sanctury. I would never have even contemplated coming here had we been staying in Melbourne itself as it is over 40km from the centre. 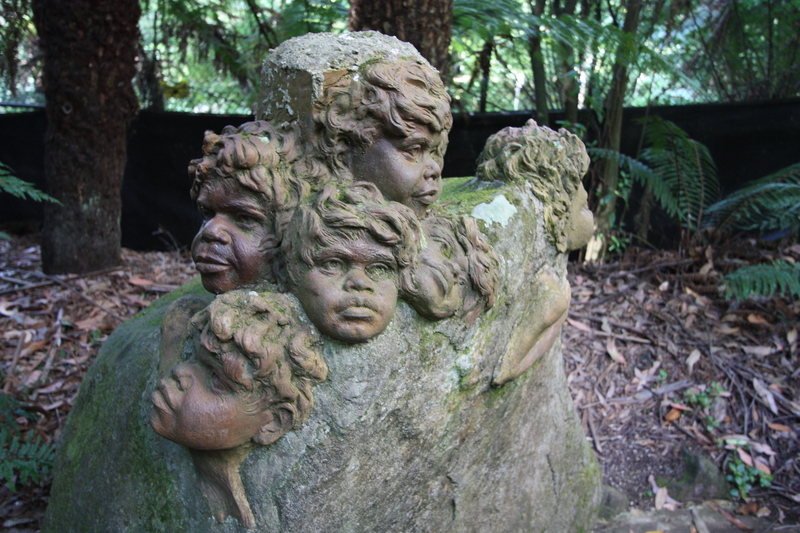 However, it is a delightful enclave of woods in which clay has been carved by the late William Ricketts onto some of the rock in the area to reflect his love of the original settlers, the Aborigines. A commentary was provided on little iPod like devices which included some words recorded by him. 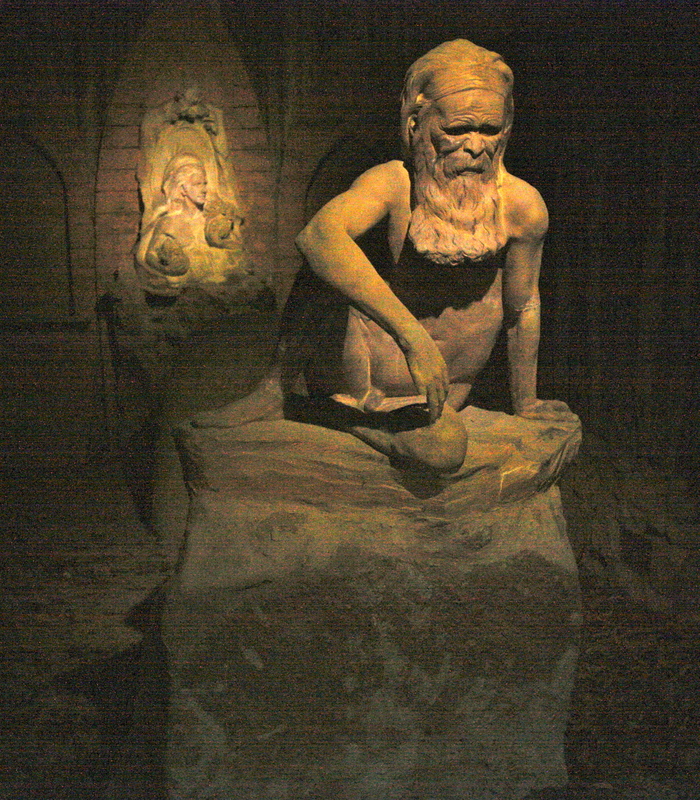 The carvings were varied, mostly of faces but unique and very quiet, good for reflection, which is what he wanted it to be. Running water in little streams is in evidence as well which adds to the ambience. 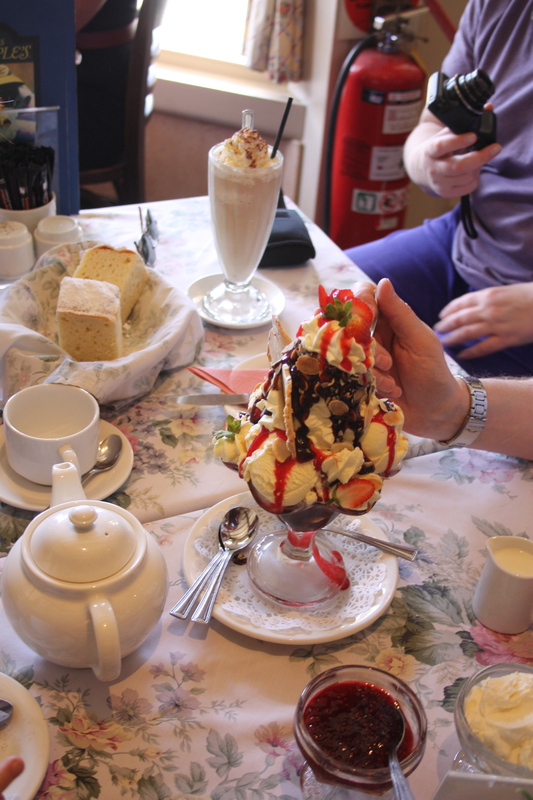 Back out and off to the cafe on the hilltop, the Skyhigh Restaurant for views towards Melbourne, a quick bite to eat, grabbing some Internet access and a walk around the gardens and back down to Sassafras where a lovely afternoon tea is served in the Miss Marple Tea Room. The Japanese obviously love it here but it was some locals who ordered the Ice Cream! Returning to Seaford for an hour or so before we venture out again for more food, this time to the Seaford RSL (Returning Servicemen’s League). Supposedly like a British Legion club, this place holds about 200 people at any one time all eating a very large meal, reasonably priced and excellent value for money. George has prepared a brief but comprehensive account of the Barklem family and has given me a copy, Barklem was my Grandmother’s maiden name on my father’s side so it fills in a couple of holes in my knowledge. 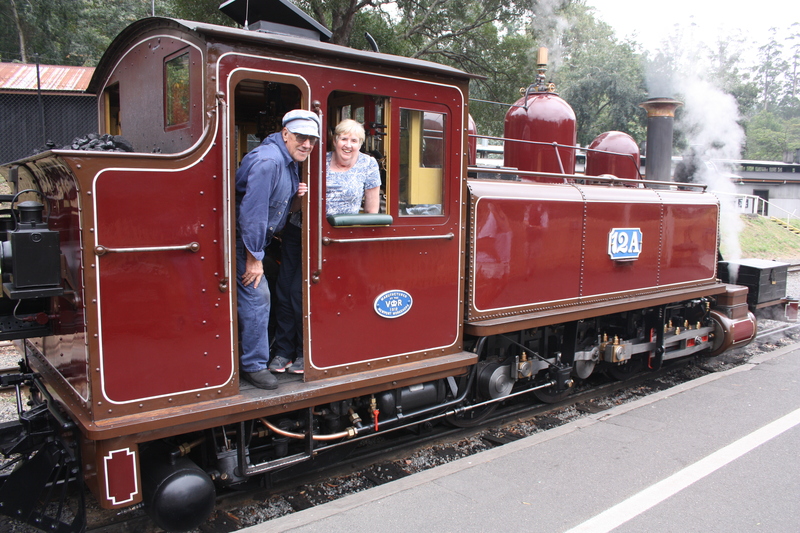 Puffing Billy day although the weather forecast is not so good. 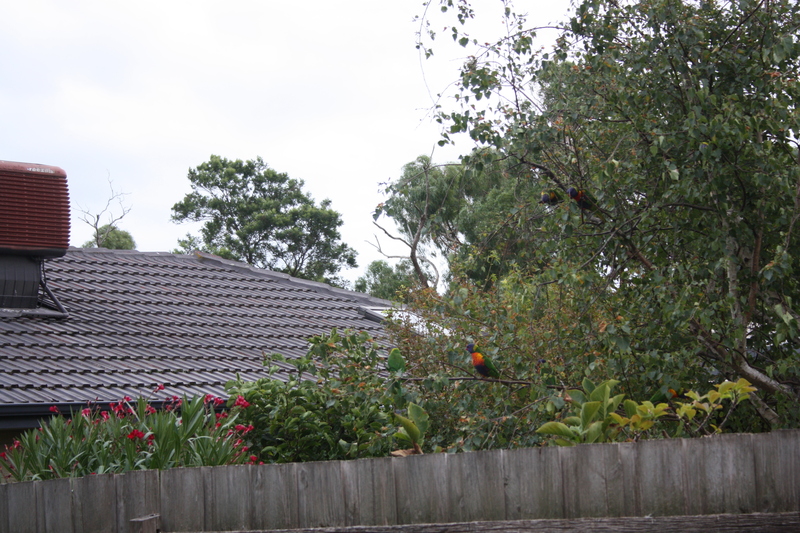 We start by watching some Rosella birds next door with their colourful plumage, just like a parrot. All four of us then set off by car to a local Motel a few blocks away, park up and get on the coach, we are the last ones on. Roll call complete, we set off towards the Dandenong hills again only this time towards Belgrave. Marree’s tours is on it’s way. A stop by Lysterfield Park for morning coffee was very welcome only by now we had cloud cover and drizzle. Some school children are on a school outing there and are setting off for mountain biking and a party of handicapped young adults are going out on the lake in, supervised, sailing boats. With the drizzle continuing, we continue to make our slow way to Belgrave, via one of Melbourne’s drinking water reservoirs. 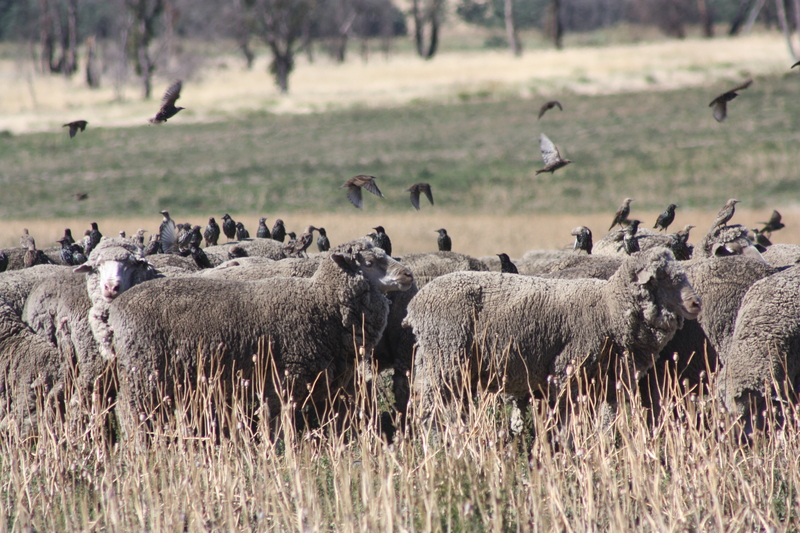 The coach is able to drive around some of the roads around it which enables us to see three kangaroos and a few birds. 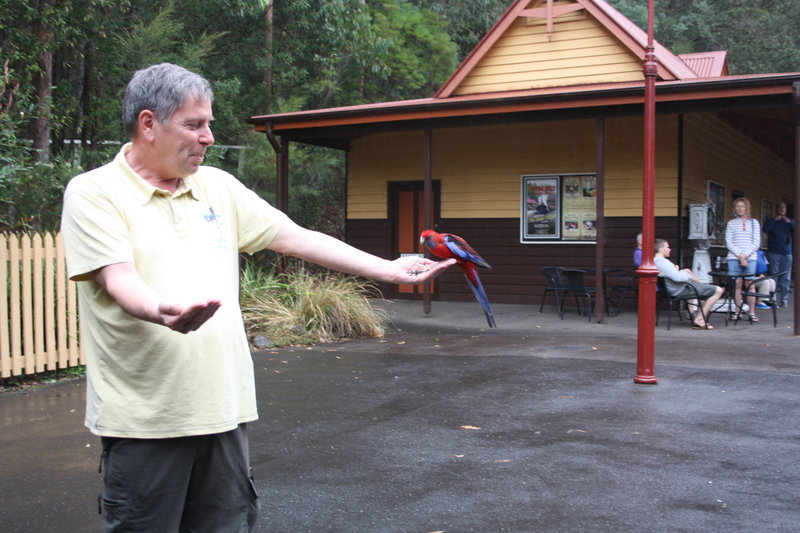 By the time we reach Belgrave and the Puffing Billy train we have turned the coach around near a cockatoo feeding area. 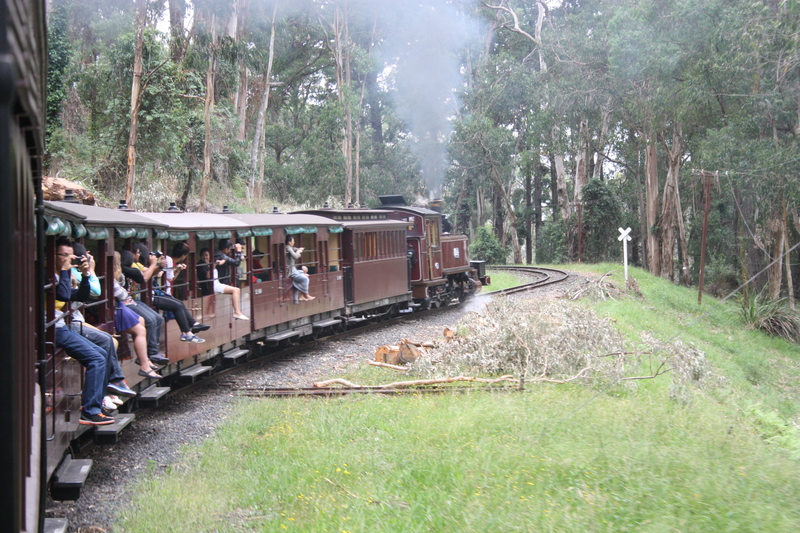 Puffing Billy is a narrow gauge railway originally built in the early 1900’s to convey fruit to the docks. The fruit no longer goes by train, a landslide put paid to that in the 1950s and is now run as a wholly volunteer tourist railway. 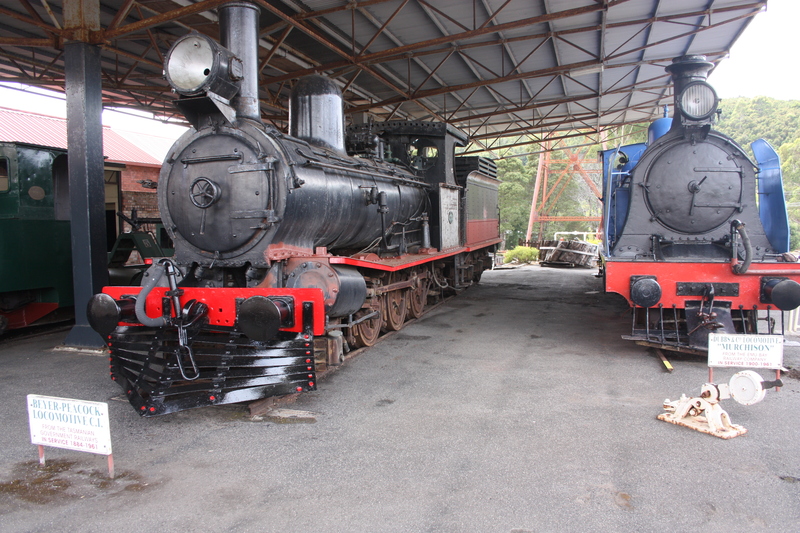 See http://www.puffingbilly.com.au for details. Our party of 40 virtually swamps the dining cars and after a brief wait, we are served a delicious 3 course meal with coffee as we chug along the 8.25 miles to Lakeside through mostly wooded areas full of gum trees and Mountain Ash, stopping at Menzies Creek to let a train pass and Emarald, briefly. A Health & Safety nightmare? The other carriages have seats facing outwards but the custom is to sit with legs dangling out of the side of the carriage, most un Health and Safety like! At Lakeside, we cross the tracks, Sally nearly got crushed by the gate, and mill around explaining to various people where the Isle of Man is, feeding the Rosella birds and being asked if we want to volunteer before we return to our coach for our return. We have already eaten an entree and a big lunch and now we have desert and coffee to look forward to on the way back. Sadly for George, the model railway cabin is not open which seems strange bearing in mind the numbers of people on the train. Pictures taken on the train do not really do the journey justice as the weather closed in and cloud turned to mist and drizzle. Can’t complain though as the area needs rain. Back in the coach at Belgrave we head back to the Motel stop, get in George’s car and off to Phillip Island for a dusk penguin watch. The sun sets and the penguins start their walk up the beach in clumps of about 7-10, avoiding the pesky seagulls which have congregated to pick up scraps of food dropped by tourists who don’t know any better. As it gets darker, the floodlights are turned on but the wind gets up which seems to annoy the seagulls. Several people obviously do not feel the cold, including a few college girls in their skimpy shorts. Some however shell out money for a wrap which at least keeps the cold off them. As soon as a few groups of penguins have started up the dunes, many of the tourists go but we stay a bit, following the penguins up the dunes. They “run” up for about 20m or so then stop, setting off shortly afterwards but not showing any sign of fatigue despite their long journey feeding in the sea. There were just under 700 on site but we probably only saw about 100 this evening. A coffee followed to keep us, especially George, awake on the journey home and we collapsed into bed exhausted. 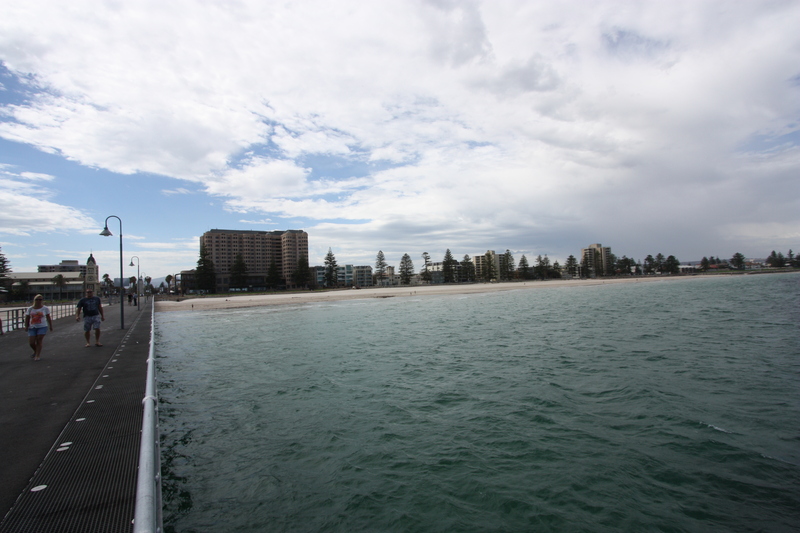 A day visit to Melbourne by train. You have to have a Miki card to travel on the trains, buses and trams in Melbourne and today we are venturing into the big city with a Miki card that works like a London Oyster card borrowed from a friend of George and Barbara. A short walk to a local bus stop and we alight at Kananook station, and after fighting with machine to top up card, all four of us travel the 25 stations stopping train to Flinders Street which is an impressive building. 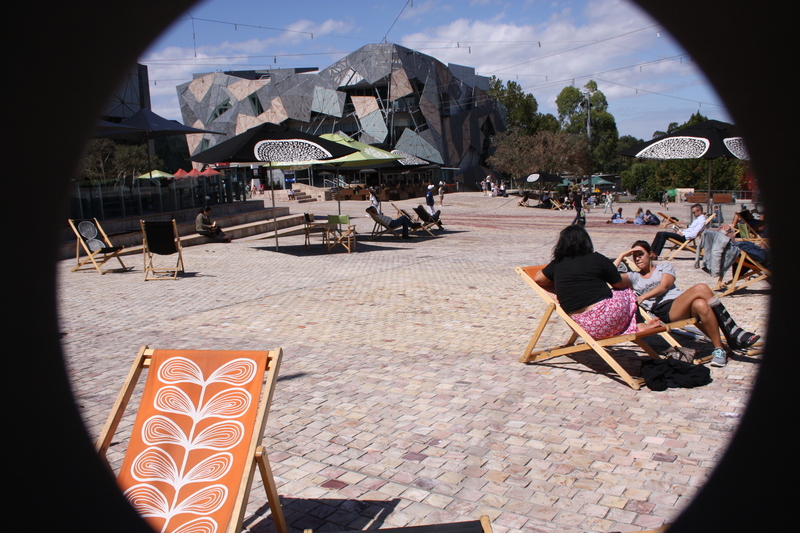 We opt for a river cruise to see some of the sights including some wonderfully situated new apartments and then opt for Federation Square for lunch with it’s array of deck chairs for people to sit on. We have to have a ride on the vintage circular tram, No. 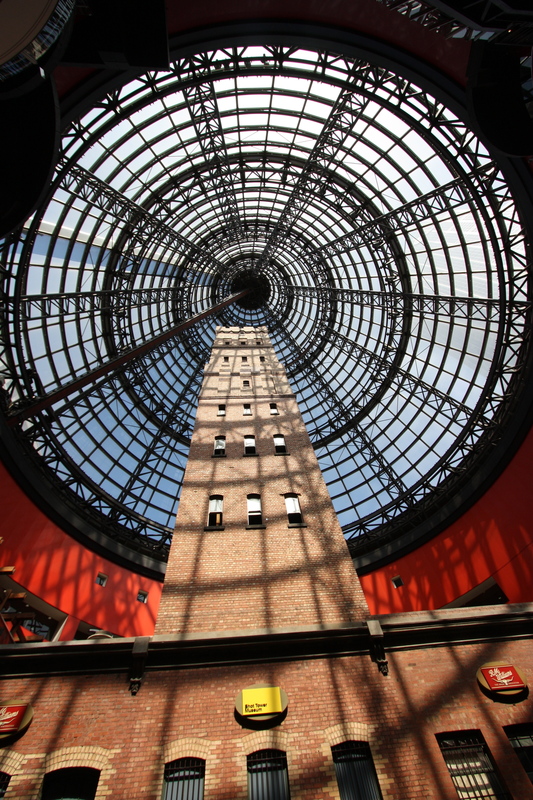 35 and this takes us to Central station, now a shopping centre, with the shot tower chimney in the middle. Shot was dropped down the chimney into sand and it made a circular hole in the sand. Another fine clock chimes 3 for us whilst we are there. 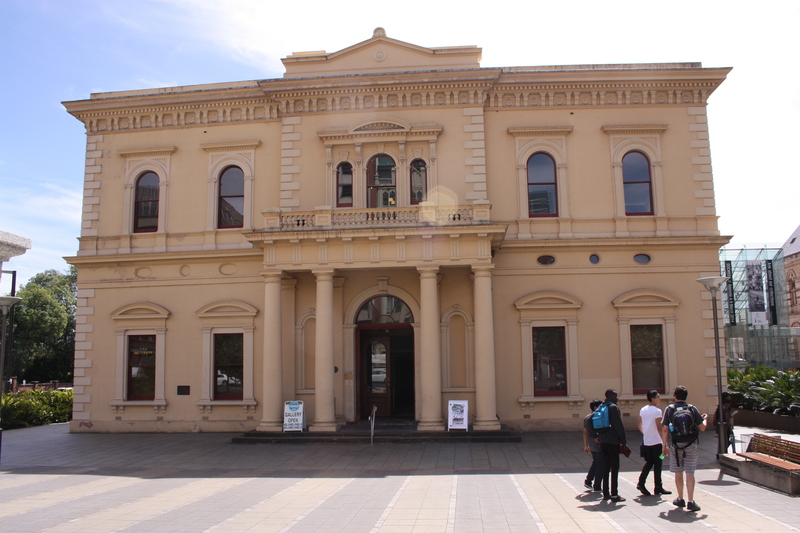 Walk back towards Flinders street Station via the Library, Town Hall and Cathedral. 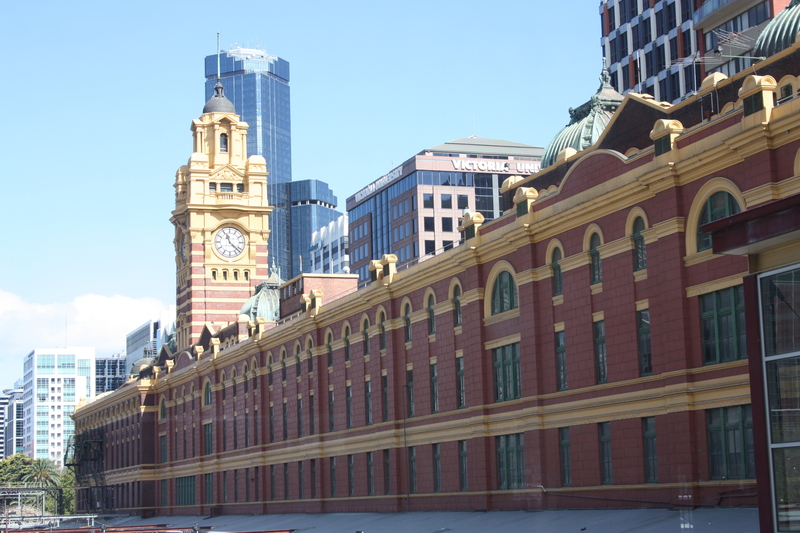 There is a local debate as to whether to knock Flinders Street Station building down and start again. Personally, I think it is a lovely old colonial building which should be preserved as much as possible. Look what can be done just by going to St Pancras in London. All in all, 4 – 5 hours in Melbourne really cannot do justice to what there is to see but needs must and we head back to George and Barbara’s house and pack up for the early start tomorrow. 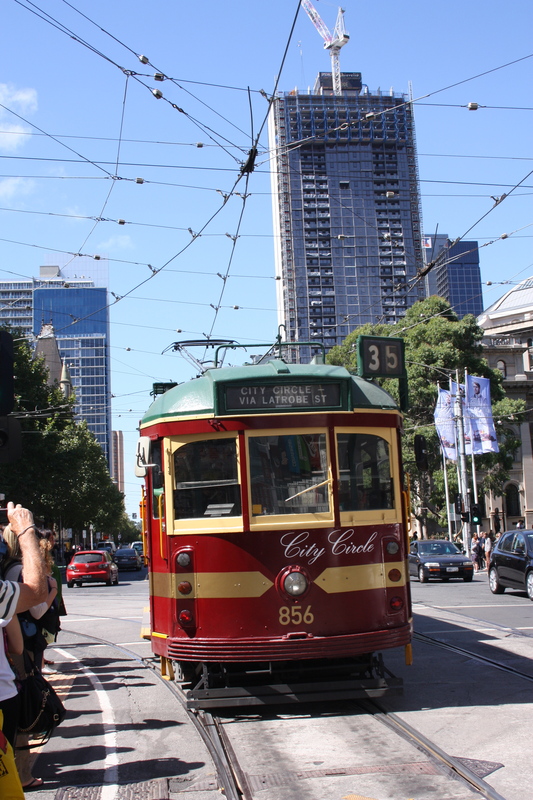 More photos of Melbourne on my Facebook page as this blog cannot do justice to the city. George has suggested we pick up our car tomorrow earlier than the booked time of 10am and has arranged this through Hertz locally for us to pick it up at about 8:30. George’s reasoning was sound and we followed him to Sorrento to catch the 10am ferry. How Audley thought we would get up to Arthur’s seat, watch the penguins at Portrush ( a dusk type activity anyway ) and get over to Cape Otway for afternoon tea is anyone’s guess – it would just not be possible in the time allowed. Ferry crossing smooth although the 1km suggested in our directions after we leave the ferry is actually 10 which really confused us. Stop in Apollo Bay to grab something to eat for lunch and arrive at Otway Lodge at about 2:30 by which time it is raining quite heavily and as usual we have the smallest room although it is a light room. Directions to get here are spot on, we had just left the trees and the drive was a few hundred feet in front of us. 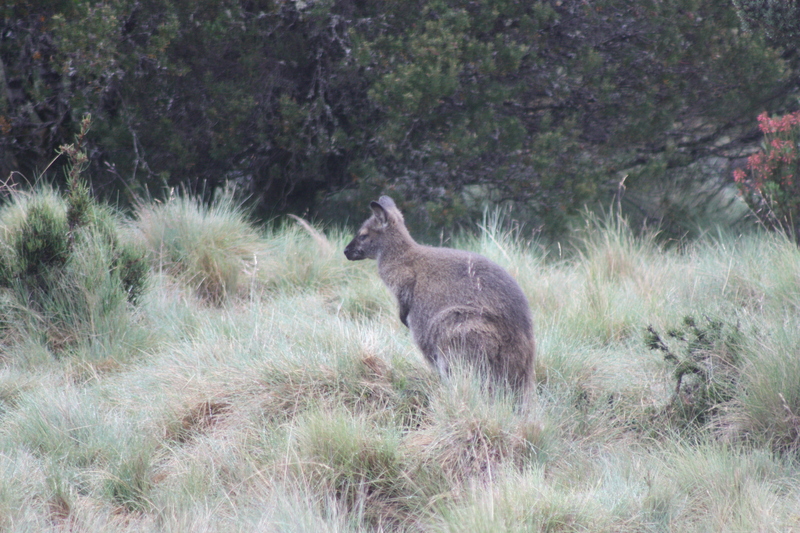 Views out to fields and woods with no wildlife in sight, but wait, what’s this – loads of kangaroo come bounding into sight, another animal in the wild we have seen. Afternoon tea is simply a drink and a small piece of cake albeit very welcome. We are told that the visit to the Tiger Quolls is at about 4:30 but by the time we set off it is nearer 5:15 although by now the rain has stopped, well almost! 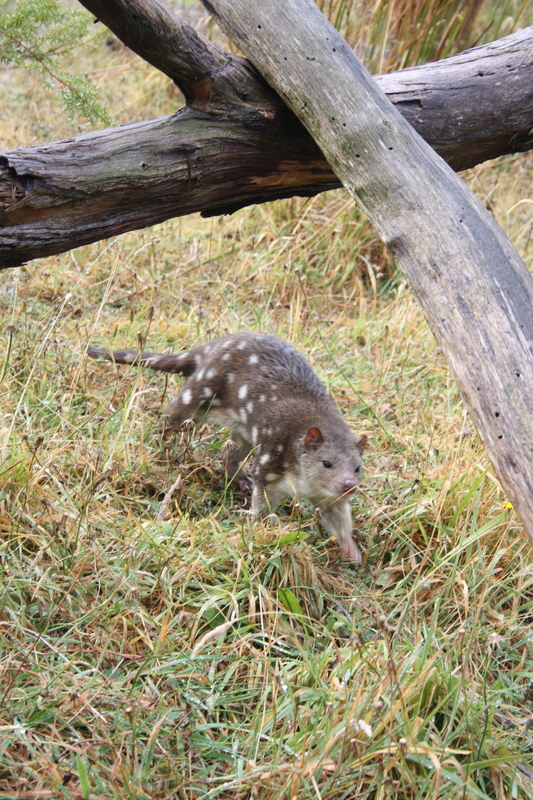 The Tiger Quoll is a spotted animal whose numbers in the wild are declining rapidly. 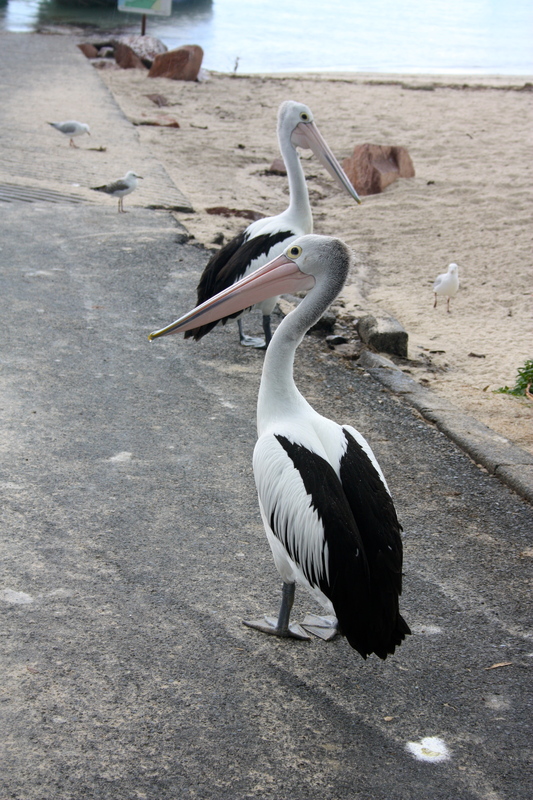 The centre has a male, a female and two youngsters. Me enter the youngster’s enclosure to watch them hunt down the lumps of meet put out for them. They have no fear of us and scurry around quite happily. These will never be released into the wild and the male and female will only be put in the same enclosure for mating purposes. Spot a Koala chomping away high up in a tree nearby. 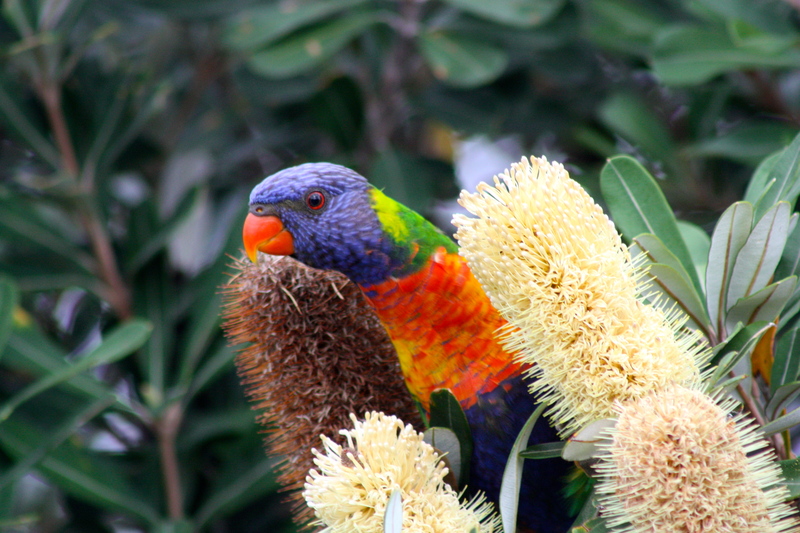 On the way back to lodge, see Yellow tailed black cookaburrow and another Koala is spotted. We stop by an enclosure where two Koalas who have been rejected by their mothers are being nurtured but only one seen and it had it’s head in leaves for most of the time. 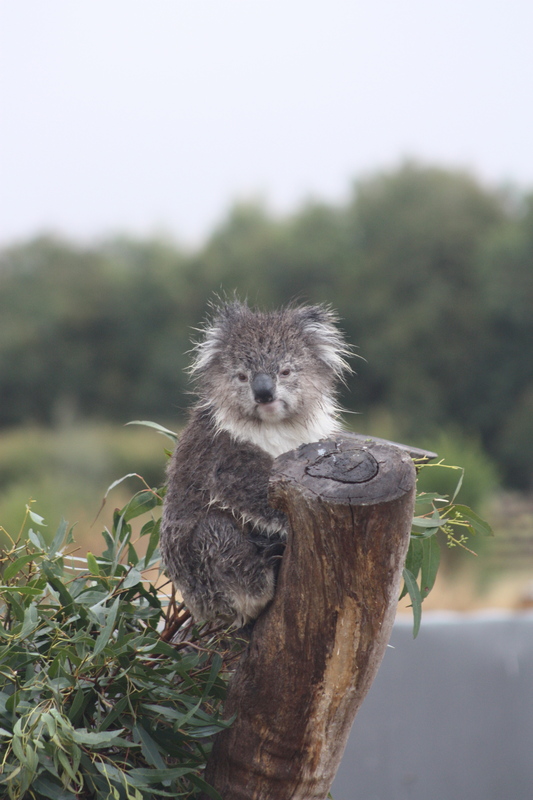 The rain does not exactly leave the Koala justice in the hair looks though. Dinner is around a big table with 2 Germans, only one of whom speaks English, two French who speak virtually no English, ourselves and two American girls who are hiking the Great Ocean Road. One of them is from Texas and is employed in the gas extraction industry, fracking, which is a hot topic in the NW of England right now. Dinner was cooked with produce grown, caught very locally and was well cooked. Out at 9 and into the Potteroo and flying squirrels cage. 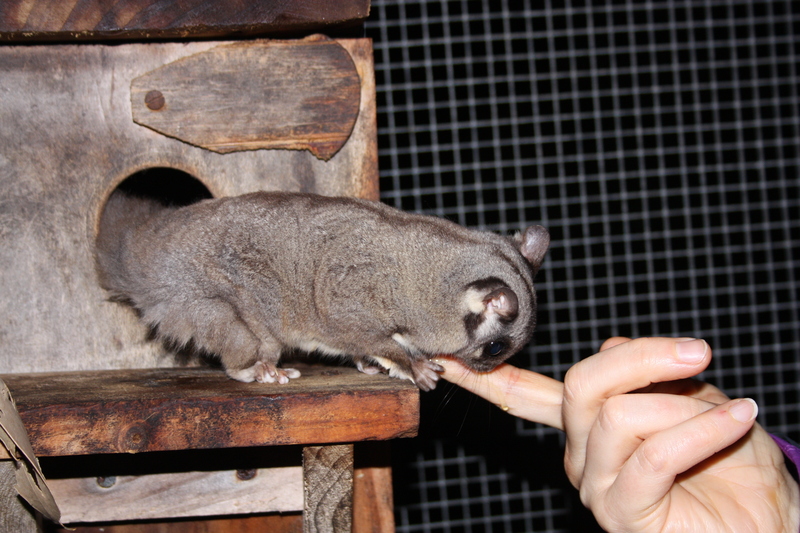 There are a few flying squirrels whose diet at this time of night is honey. Most of us take it in turns to dip our fingers in the honey pot the guide (actually also our Cook) has brought with us and let the squirrel lick it clean whilst the Potteroo scurries around the floor. The only time it kept still was when one of us humans managed to massage it’s neck. Fascinating – and a wonderful day. 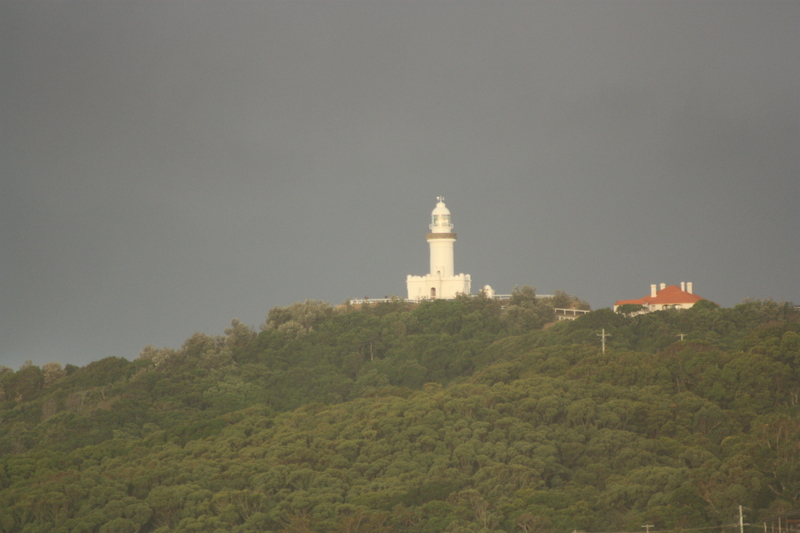 Set off at about 10 for the lighthouse at Cape Otway although don’t go in due to the possible steps. Instead head for a 1km walk which is described as Easy, back on the main road. 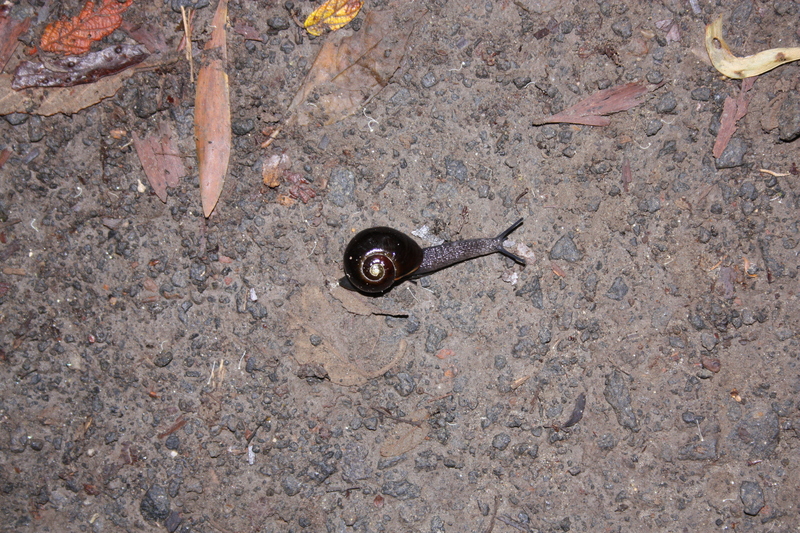 In fact the track is up and down quite a bit but there are no steps with lots of interesting tree roots and we even see a Cape Otway black snail, another endangered species. 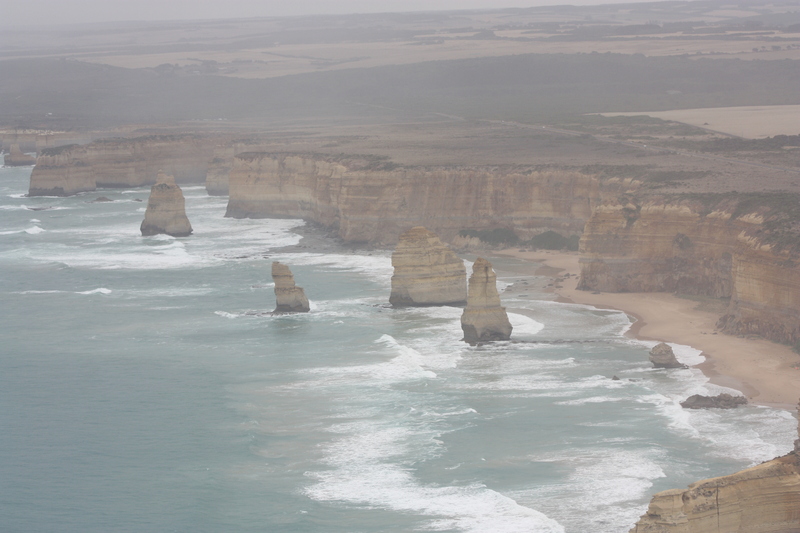 Now head for 12 Apostles which is arrived at via the gateway which tells some of the history of building of the road. Lots of twisting roads that undulate and often have overhangs of the ubiquitous Mountain Ash tree which is unique in shedding bark regularly, grows to enormous heights and widths. Lots of people at all the stops on the sea side of the road to try to get a glimpse of the stacks but it is not the best of weather, at least it is not raining though. At main car park make an impulse purchase of a helicopter ride over the stacks and down to London Bridge. The journey is over too quickly but we do get a fair number of pictures despite the poor weather. So many people in the area and a very small gift shop which consequently is much too crowded. Try to get lunch in nearby Peterborough village but this really does not have anything going for it at all, despite the Audley brochure telling us otherwise. An historic pub a couple of km is signposted but the chef has gone home due to lack of custom! 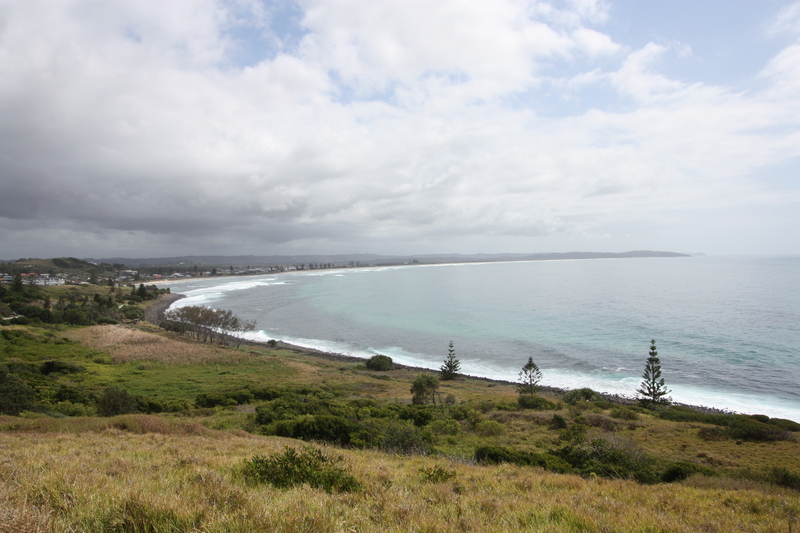 On towards Port Fairy our next overnight and stop by the Cheese factory for a very good ploughman’s lunch. 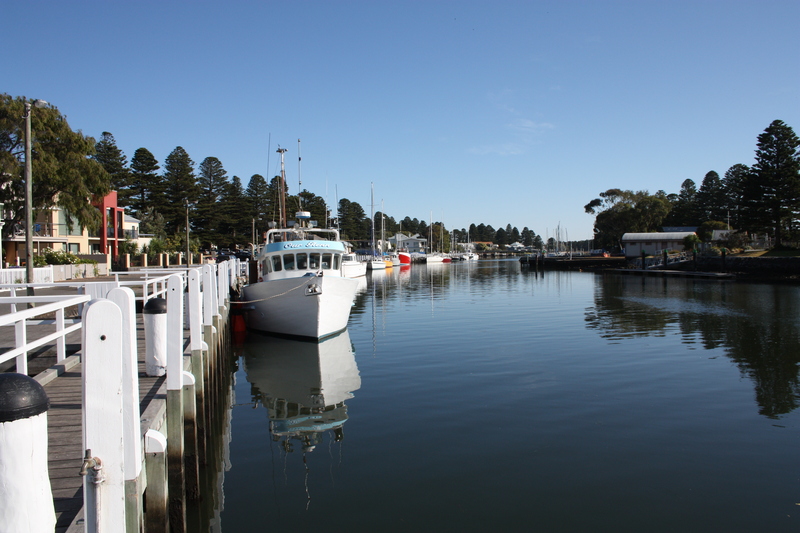 Drive through Warrnambool and arrive at Port Fairy. We had been told at Cape Otway lodge on check out that the music festival was on in Port Fairy and whilst our brochure had said it took place in March, it did not say exactly when so it was somewhat annoying to say the least that the road to the hotel was shut and that market stalls were outside the hotel, itself in the middle of town. Have to abandon car and walk to hotel to check in, walk back to car armed with a permit before police will lift barrier to let us in to the restricted area that surrounds the hotel. What’s more, there is no parking at the hotel until we move a bollard. Manager helpful but we have to move car to outside someone else’s cottage. Manager also says he has lots of trouble with the agent Audley use, ATS, and that they shouldn’t have booked us in there as non festival goers. 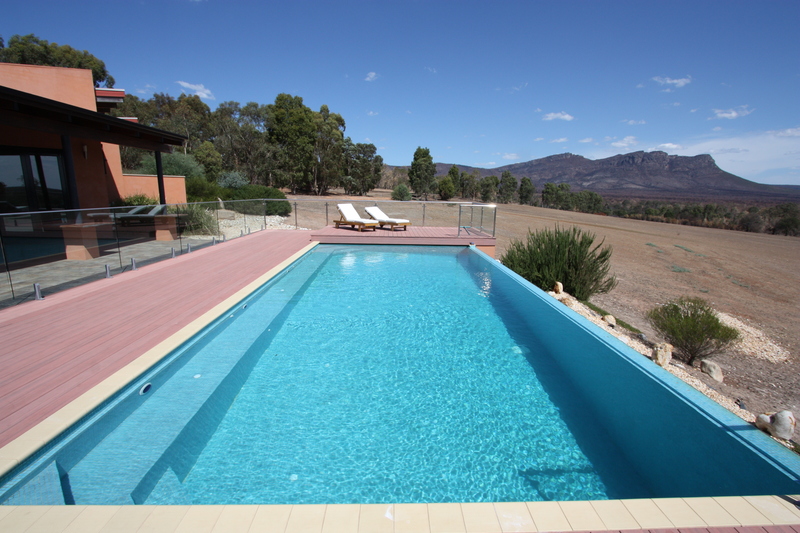 Manager reckons he could get A$500 a night over festival time – I hope we didn’t pay that. A somewhat rude comment I thought especially as he said there was no available accommodation for 100km when I suggested he found us alternative accommodation. No lift to first floor room which doesn’t help the situation. We will not be able to get out by car and guarantee getting back so are trapped in the hotel and town which itself is populated mainly by teenagers. It is like sending us to Glastonbury when the festival is on when we don’t want to go to the music. 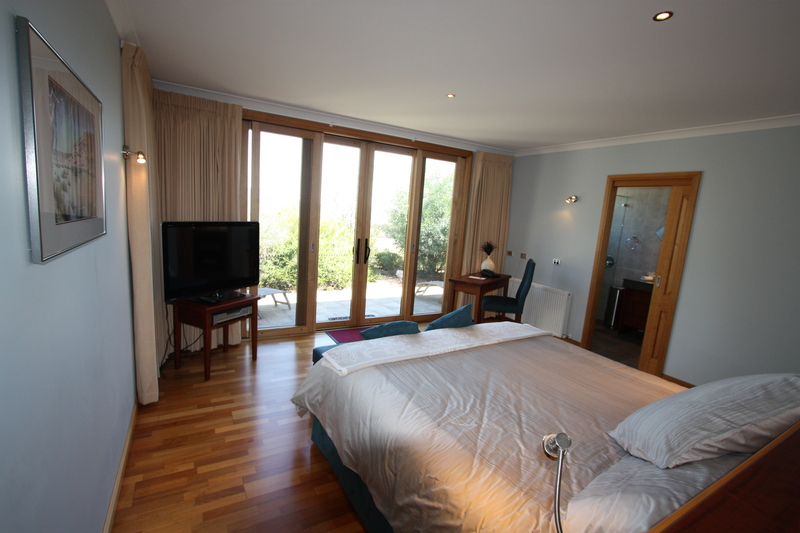 Room however is quite comfortable and we manage to do the washing (free service) whilst Sal has a rest. Wander out at about 6:30 and have a meal in a Chinese Restaurant without any difficulties by not booking. Not sure what Audley meant when they said the eating facilities were limited. Back to hotel via supermarket for yogurts and a general catch up on paperwork. A remarkably good night in the circumstances and after trying to buy croissants from the local bakers without success. Leave hotel and get Police to open barrier for our exit and drive to river park for a few photos of river. Loads of people heading for nearby stage which slows all progress so we head for our next night’s stay in the Grampians. On way, fill up with fuel in Hamilton and Cafe 109 in Dunkeld before heading up to Hall’s Gap. Road signage not good so check route prior to ascent on a twisting road up and up into the mountains but still manage to take the back road rather than the direct route. Close to top, evidence is first noticed of the devastating fire that occurred 7 weeks ago. We now drive for probably 15k with no noticeable intact tree in sight although some are now re sprouting which is a good sign. At Meringa Springs we check-in once we have found the owner; we have arrive at 2:15 and check-in is supposed to be at 3. This a fantastic hotel, only saved from the fire by Australian Fire Service’s helicopters dousing the property with water with the hotel only re opening a week ago. It has got to be the best hotel we have stayed in on this trip. Temperatures too hot (31C) to go outside and with everywhere burnt in the vicinity, not a lot to see and little shade, so after an hour relaxing in the cool bedroom overlooking the Grampian mountains, head for the Infiniti pool for a good swim followed by a good meal and a weekly dose of Rake on the TV. No noise outside when we stepped out just after midnight, absolutely lovely. 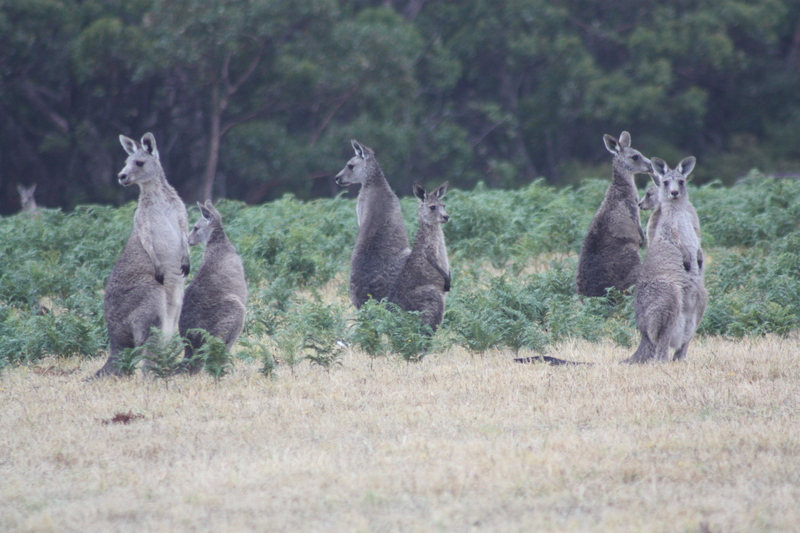 We awoke to kangaroos in the field around us this morning and after breakfast head for Horsham, the A8 and Adelaide. Horsham is about 40k away and is where the local children go to school. Some journey! By the time we get to Horsham, it is cloudy, muggy and very hot, up to 36C. This is now a long slog on an uninteresting road a bit like the roads around Ely in Cambridgeshire. The road follows the main railway line for most of the way but no trains seen and very few places to stop for lunch as today is a public holiday. Stop at the Windmill cafe at Kaniva for lunch which seems to be the only place open on our journey, even the recommended cafe at Keith is closed for the holiday. A few interesting pieces of artwork in Kaniva adorn the walkways. Drive into Adelaide, at first a steep drop from the M1 and Adelaide Hills but flat in the city with Rendezvous hotel easy to find. Check in with our room on the 15th floor, now why couldn’t we have been put in something like this in Sydney albeit it is in the business district and not the shopping area. Out for a wander for something to eat, but everything closed, presumably for the Public Holiday so eat in bar in hotel. A R&R day, so up late and get breakfast at nearby Public 41 cafe. We have the car today but weather forecast is not good so we head for the seaside at Glenelg for a walk around. We could have taken the tram had we known as it is the terminus and it stops not far from the Rendezvous hotel. Not a lot going on by the beach as it is windy so head into town for coffee. A lot of shops but not a lot to buy. Take car back to airport and catch bus back into town just before it starts raining hard and opt for an evening meal from an Italian in the shopping centre. Again, not a lot of choice as most things catering for office workers. 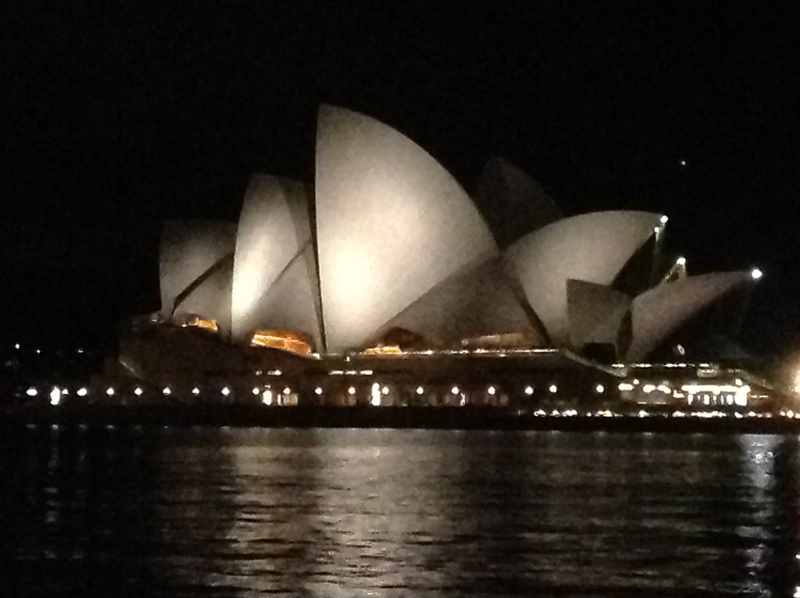 Early start with a taxi to the airport for a flight to Kangaroo island. A 36 seater for a 20 minute flight that is probably 2/3 full. 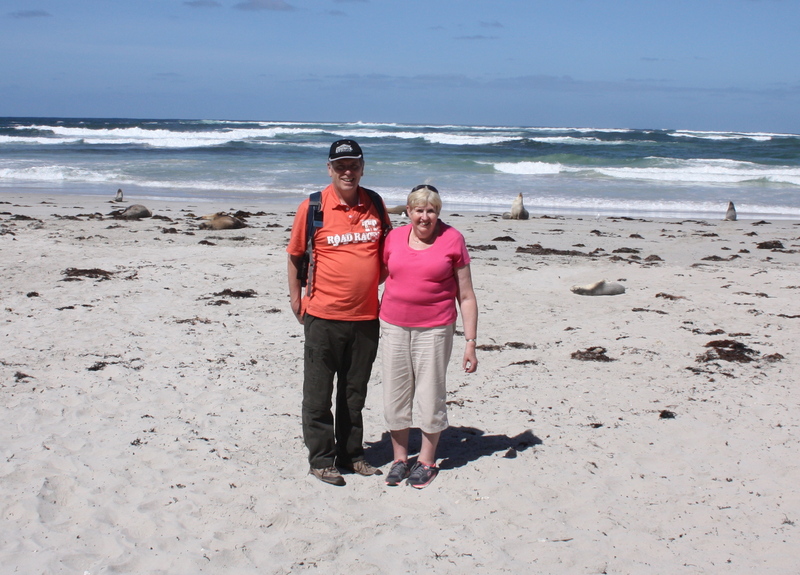 Met by Gaynor and Mary at Kingscote airport which is a one hut, two person airfield and along with 6 others, get on board an off roader which takes us to the Sea Lion beach on the South of the Island. Kangaroo island is bigger than we thought with the longest distance between two points being over 100 miles, miles and miles of sheep country with Euclyptus trees bordering most roads. So far, all tarmacademed roads for the 4500 population. Both Gaynor and Mary tell us about their lives on the island and how they both got into farming. Both have family ties to farms but tourism on the island is now as important as farming for the island’s economy. 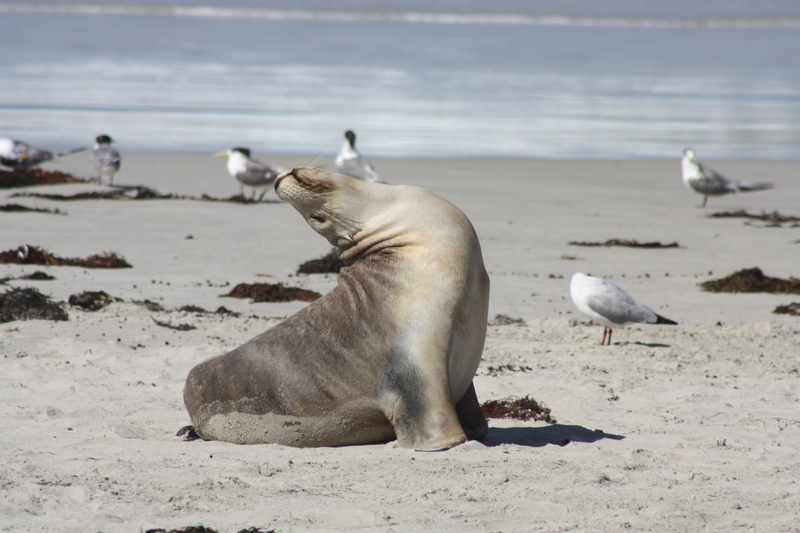 The sea lion beach is our first stop and a bit of a tourist attraction with several parties viewing the animals at the same time. Some of the sea lions had pups with them which were following their mums around all the time. A few big males lazing in the sun. Back up from beach, Gaynor stays with Sally which is nice to help her up the hill and we head off for a stop for light refreshment including some biscuits made without eggs! Onwards to the north of the island and a stop for lunch in a field: we just drove off the road, through a field of sheep on no visible track and down to a clearing in the field where a friendly farmer has laid out an awning with seating. Food, brought by Gaynor and Mary is cooked; fish, lamb’s cheese washed down with some local wine. Fantastic. Back on the van we go in search of kangaroos, wallaby and other wildlife listening to more tales from the countryside according to Gaynor, how her in-laws started the farm that is now run by her eldest and youngest sons, how they had built the houses of the farm without having any building experience at all. Stopping at Stokes Bay Area, we see a Koala in a tree; this one had a young one with her but wasn’t going to co-operate in allowing us to photograph the baby. More refreshments, coffee, tea, biscuits and cake before a walk down to Stokes Bay which is through a very narrow gorge cut in the rock in places but mostly a natural passage which could be claustrophobic for some people. Wonderful safe beach with school children playing in the sheltered part and others enjoying the surf. Sadly we now have to return towards the airport but do stop at a look out where it is possible to see the black silky cockatoo. Again, not very co-operative birds so no photos of any note. All too soon we are back at the airport, saying goodbye to some of the other passengers, including some Audley customers from Woodley near Reading who had started their travels a month before us but who have been out up in a different hotel in Adelaide but who were equally not overly happy with certain aspects of the service from ATS / Audley. A wonderful experience. Flight back to mainland is virtually full and on arrival catch bus back into town rather than a taxi. Dinner in hotel again and Skype Mel who had lost her voice. Clear warm day so set out for breakfast and then the Central Market. Others we have met along the we have said it isn’t a particularly good market but we saw nothing wrong, Sally buying a book and some strawberries for desert tonight. 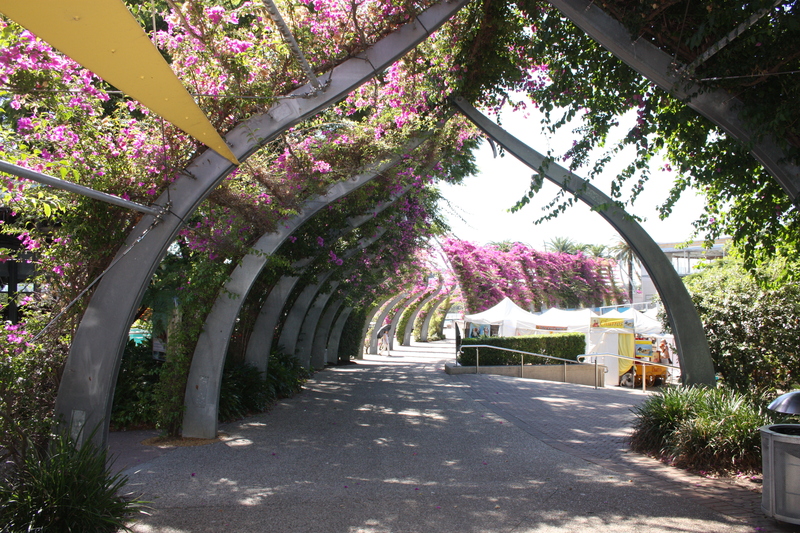 Head off into town and find the shopping arcades before going to the Immigration Museum. A couple of school classes are being taught what it was like in the 1950s using borrowed smocks and from what we heard, the teachers were making it fun for them. Certainly it was not always a bed of roses when they got to Australia, mainly from Britain, and there was a lot of hardship along the way. 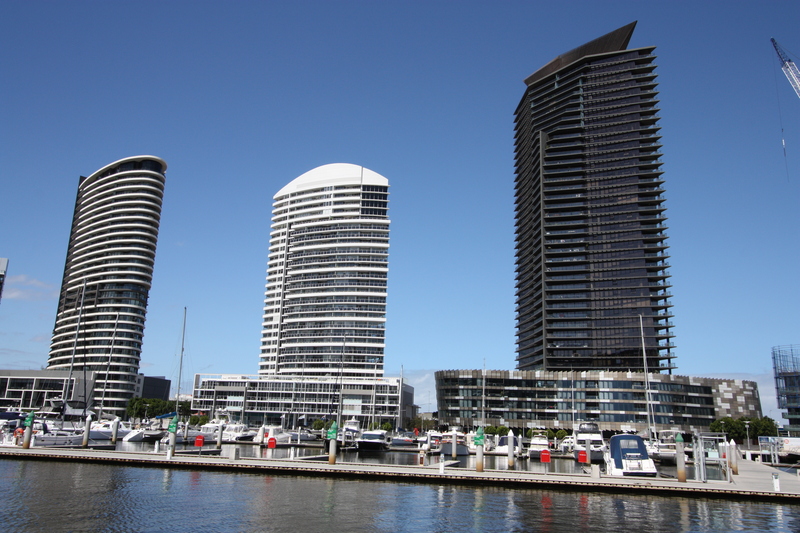 South Australia is a multi cultural city although the Governments of the early 20th Century and before were promoting a British, whites only policy. The state still needs more skilled labour. Lunch in a food court, a brief look around a shopping mall and back for a rest. Later, Richard ventures out to have his hair cut and (about a 2 mile) walk to the river by the Adelaide Oval, along the river and back through the shopping street. Out for dinner and choose a rooftop restaurant, Gallery, opposite the modern newspaper office near the hotel before Skyping Sarah. Tomorrow, a flight to Brisbane, so watch this space. Off to Tasmania after breakfast in Starbucks. Travelodge absolutely mobbed pre check out with a group in and a group out. Hotel happy to offer a refund of phone call and transport to airport in view of complaint about smelly and damp room on arrival but pre-booked (by hotel) transport never materialises so hotel persuade a taxi to get us to airport free of charge (to us). Not a place I would wish to go back to. Virgin Australia efficient at airport and we arrive in a cloudy and cooler Tasmania on time, collect luggage and off to hotel in taxi. Tasmania only has a population of .5m with probably half of these in Hobart, or as one local shopkeeper told us, “Slowbart”! Our somewhat dark room appears to be one of the smaller of the rooms in the Old Woolhouse and certainly is not a self catering room as envisaged by Audley as there is no cooking facilities other than a kettle. Nevertheless, it is dry and doesn’t smell of damp, unlike the Sydney one. Wander down to Harbour, not a lot to see but have dinner in a fish restaurant which was probably on the site of an old warehouse and find Woolworths for some fresh milk and a few other goodies. Woolworths in the UK ceased trading about 5 or so years ago and never was a supermarket, concentrating on cheap everyday items – perhaps it would have stayed with us if it had branched out? Late up so do washing after breakfast then down to the Salamanca area with some fascinating boutique shops and up to Battery Point. 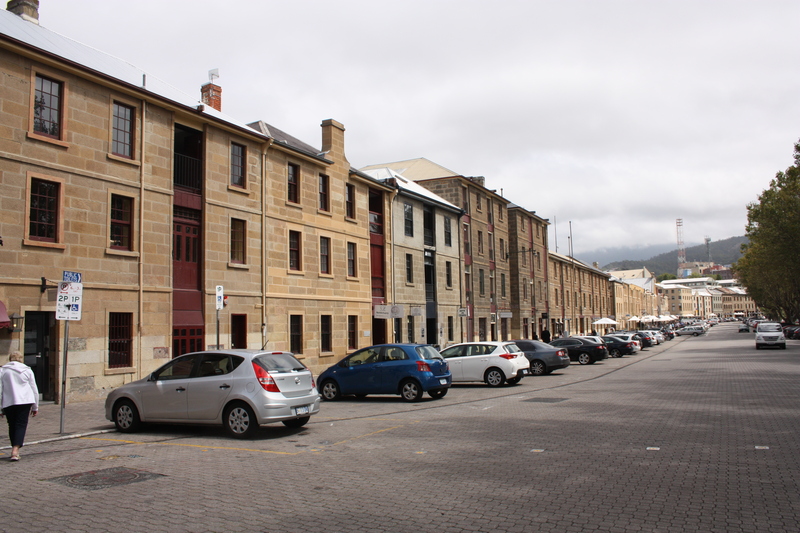 The Salamanca buildings are made of local sandstone and used to form the seafront years ago before land reclamation pushed the sea back so that it is now on one side of a broad tree lined avenue which is used on Saturdays for a market. 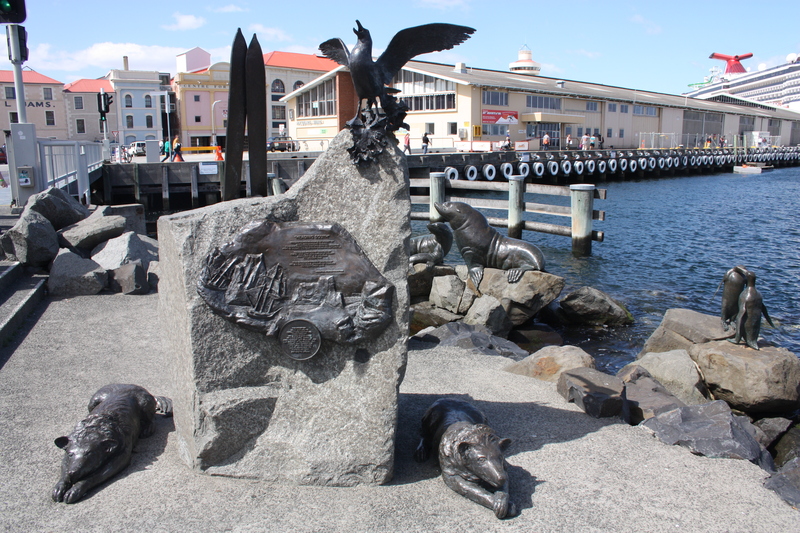 Take a Trike ride as our introduction to the rest of Hobart as we don’t have a car. 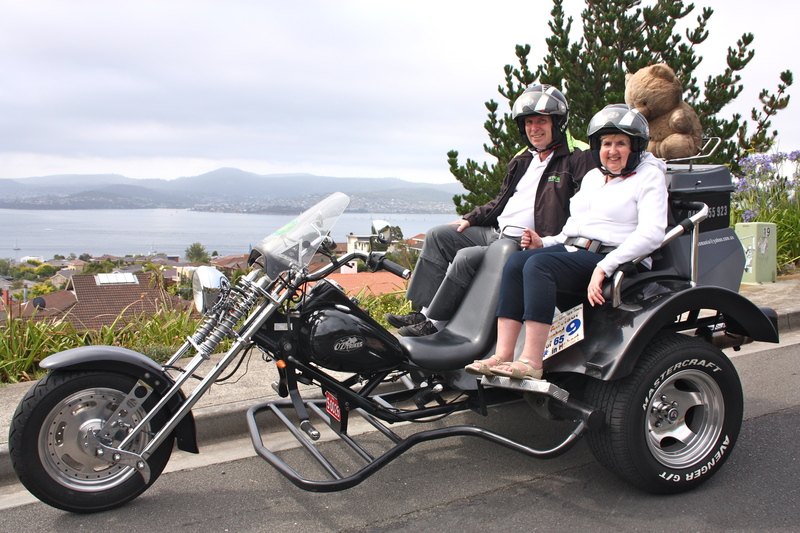 Dave Glazebrook’s trike mania adventure tours takes us into parts of old Hobart we would never have seen, up into the hills where some houses change hands for figures in excess of A$3 and all have a view across the bay. 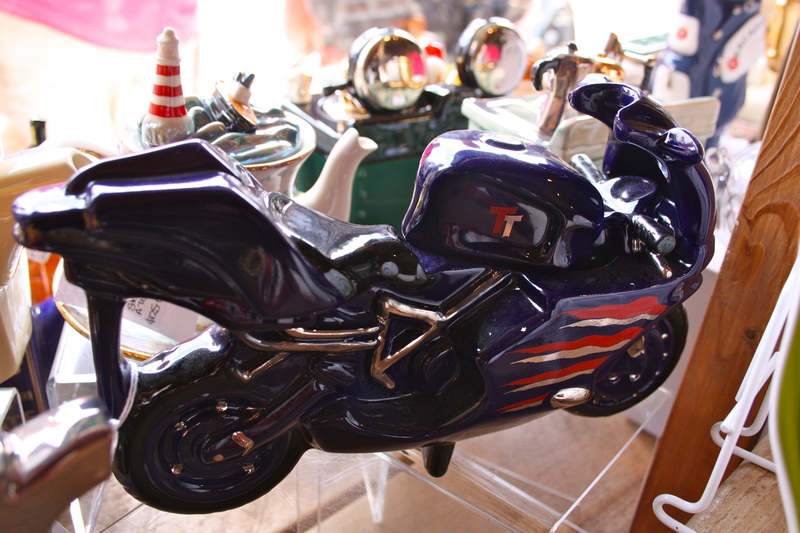 Dave’s late father competed in the TT some many years ago and Dave still has his father’s silver model trophy for completing the course which he is very proud of. Dave takes us down a few hairy steep hills and around a few steep bends but we do eventually arrive safely back at the quayside. 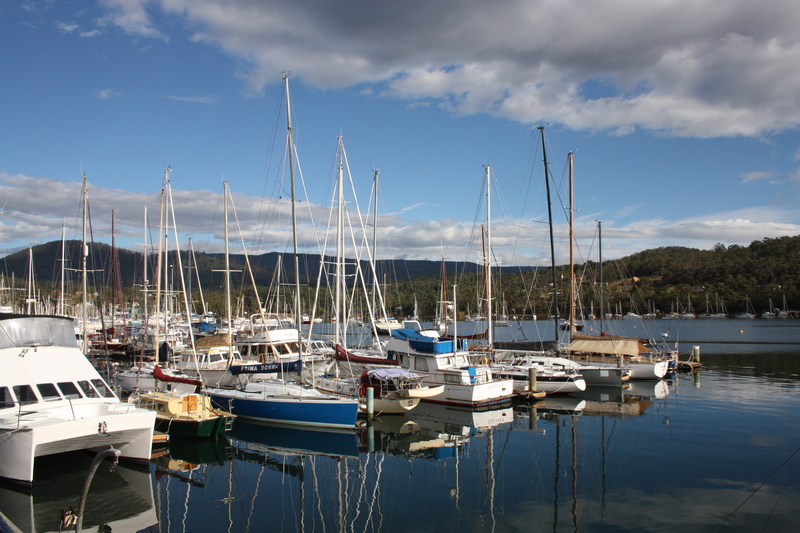 Day trip to Bruny Island involves an early start, a coach ride to Kettering, a sleepy little port with some nice boats moored, and a somewhat antiquated slow ferry that doesn’t necessarily stick to the timetable. Coach takes us on to Adventure Bay, a chance for a coffee and on to the jet boat for our journey around Bruny Island’s spectacular coast. 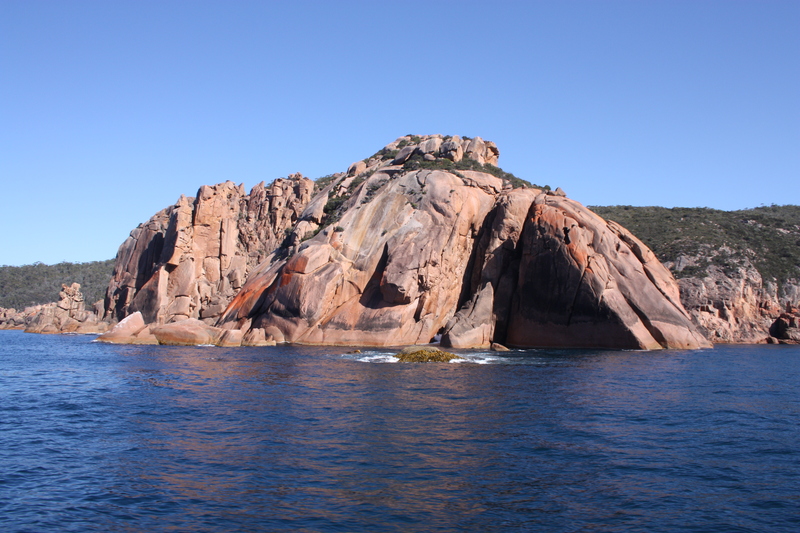 First there is the Dolerite rocks and then the sandstone rocks, all of them magnificent in their own way. Loads of caves and coves with one in particular, a blow hole, throwing up water like a geyser as the air gets replaced by water and then blows the water out when the water level drops (a brief video is on Facebook). Quite a calm day to start with but winds pick up and as we get to the point of land that marks the boundary of the Tasman Sea and the Great South Ocean, the waves are by now somewhat nearer 15ft so it is a bit choppy! 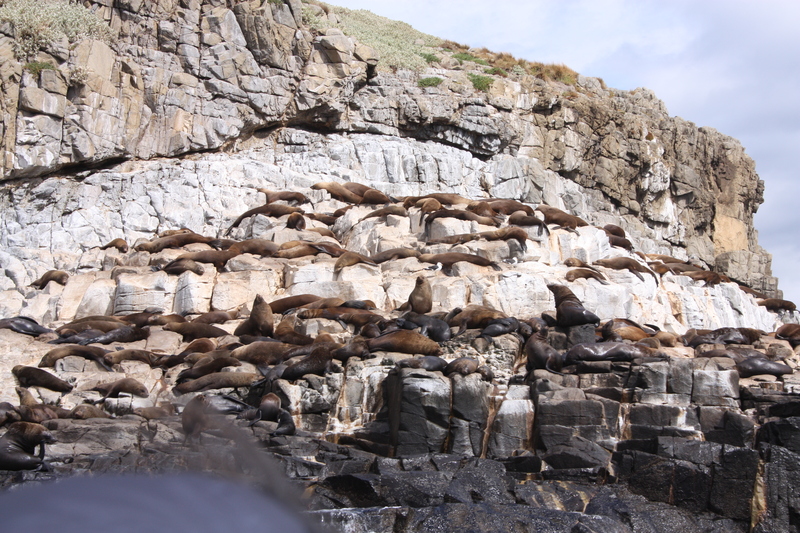 Many Australian fur seals basking on various outcrops of rock and even more spectacular scenery including a small passageway between two stacks that we navigate three times (just for effect you understand!) at high speed. 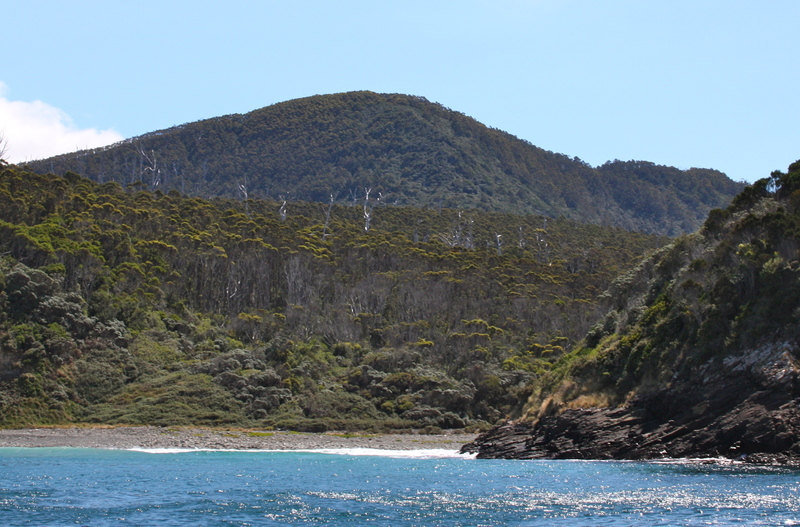 Dead trees are evident on the cliffs, a legacy from the 1967 bush fire that crossed the sound from Tasmania to Bruny Island. 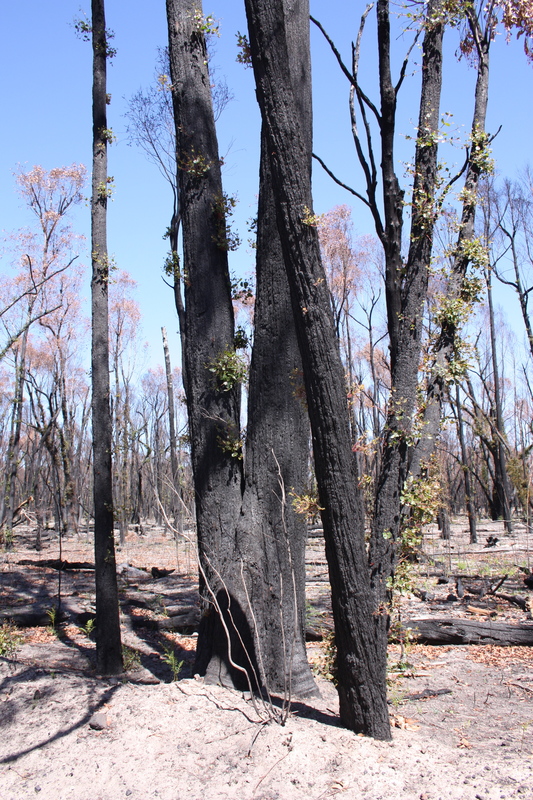 The whole bush fire killed 62 people and the dead trees still stand as there are no termites on the island to eat the bark. Returning to Adventure Bay is exhilarating as the wind is now in front of us and we are going at speed looking for dolphins. Sadly none spotted so return to cafe at Adventure Bay for a lunch that included hot soup which was very welcome. Back to hotel via chocolate factory shop, Oyster shop and the ferry at Kettering. The whole area used to be an Oyster centre but many of the beds were exhausted a few years ago and only now coming back to life. Dinner in hotel although they seem to have under catered as a couple of items were sold out. A breezy but dry and sunny day so ensure we have some headgear as previous day’s wind has caused considerable peeling of face on both of us. 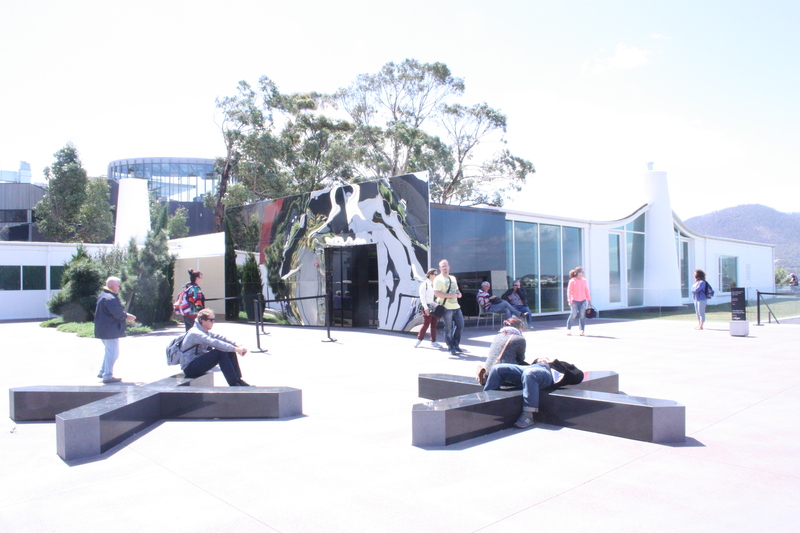 Audley suggests a visit to MONA! 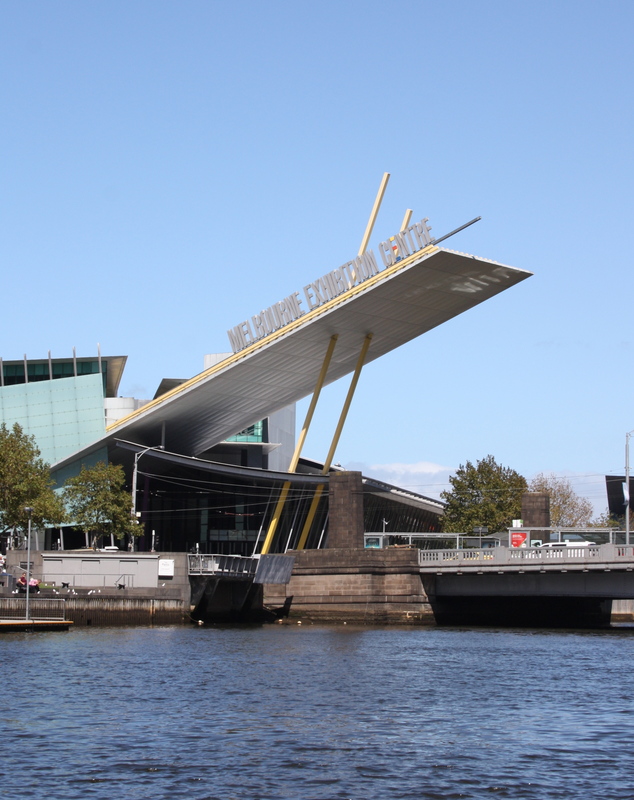 A museum of art which is a fast ferry ride away and we get chatting to a couple of Australians from the cruise ship in today – the Carnival Pearl which had stayed an extra night because of inclement weather overnight. Wasn’t it a bit early for beer though, Vanessa. Contrary to our literature provided, it is not free entrance but nevertheless we still go in. The museum is basically all underground so the 99 steps to the top from the ferry jetty are matched by three floors of exhibits back down into the land from the top. As I said about the Tate Modern in London last June, modern Art is not my thing so our stay there was not as long as others suggested it might be although the buggy ride from the vessel to the museum to avoid the steps was a thoughtful touch. There are many items that to me are not really art but what I did like was the red Porsche car, the quirky table tennis table, the water fountain which “drops” words from jets to the floor – ingenious and “insects” positioned away from the wall as if flying. Descriptions are provided by hand held devices, similar to Woburn Abbey. Locate Hertz car rental building for tomorrow, guess what, it’s up a hill! Back to Mures for more fish and chips and then pack – we have a car from tomorrow! Check out after breakfast, leave luggage and off to Salamanca Market. Many rows of stalls set out in front of the lovely sandstone shops and absolutely crowded with both locals and visitors. A couple of presents bought along with lunch and whilst Sal walks back to hotel, Richard collects car and drives back to hotel to collect her and luggage. Our Hyundai car loaded we find the A1 out of Hobart towards Strahan (300 miles) which is quite crowded although by the time we get to junction with A10, traffic thins out and we soon loose the two lane carriageway so speed slows. Uninspiring countryside looking parched from a lack of rain and very under-utilised from a livestock farming point of view. 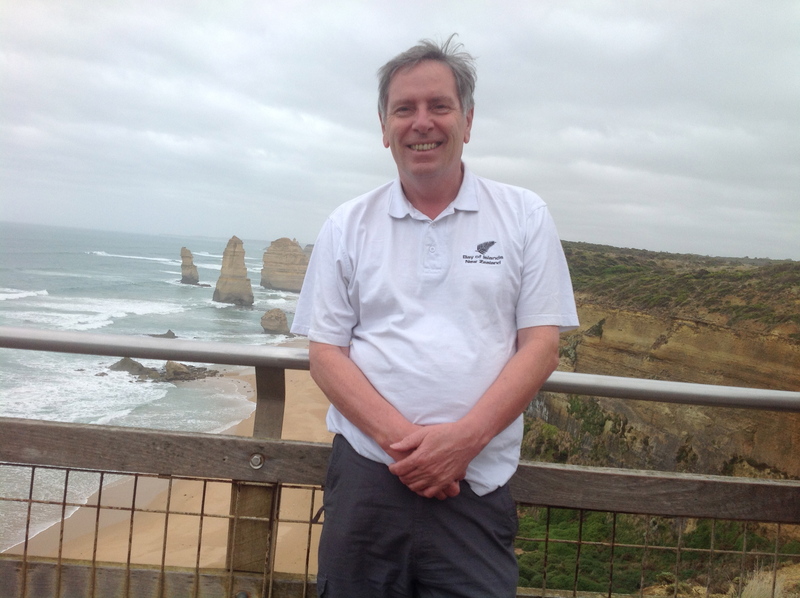 Queenstown TAS, not to be confused with Queenstown NZ – as if you would! Pass settlements with names such as Tynwald, Linda and Gretna until we reach the hills above Queenstown. Now Queenstown in NZ is delightful but this is a mining town, say no more. 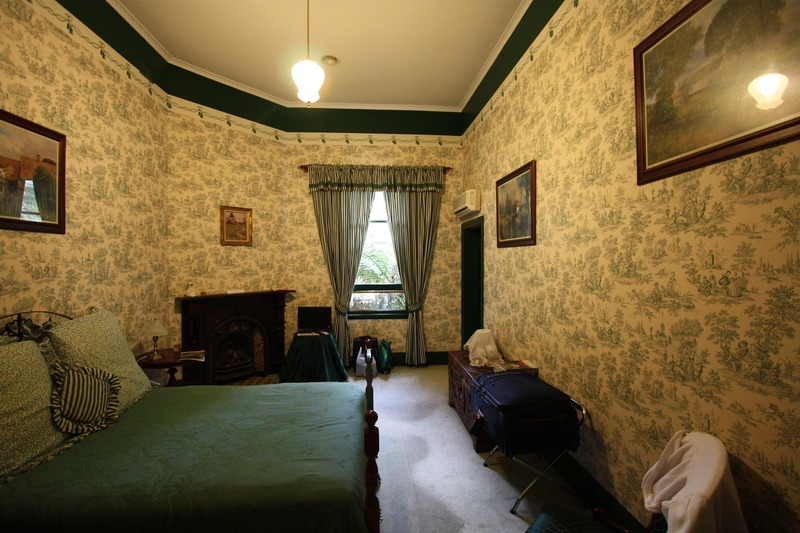 Strahan is reached a further 41km further on and we check-in to Ormiston unpack into a very quaint old fashioned style room (Jessie) which again is very dark. Our room has a side room before you reach our bathroom which is huge but cold underfoot. Dinner was reserved for us in Risby by the owner of Ormiston, thoughtful, but she probably has a financial interest in it. Food OK, wrong choice by Richard and an upset Englishman on the table next to us. Up early for a boat trip up the Gordon River where some of the first Western settlers arrived. Boat probably only half full but an absolutely gorgeous day for a cruise, not a cloud in the sky and virtually no wind. We are told that this part of Tassie has over 300 days of rain a year so we are very lucky. Out into the bay and head out to the channel before entering the Great Southern Ocean – next stop Argentina if we go due West! 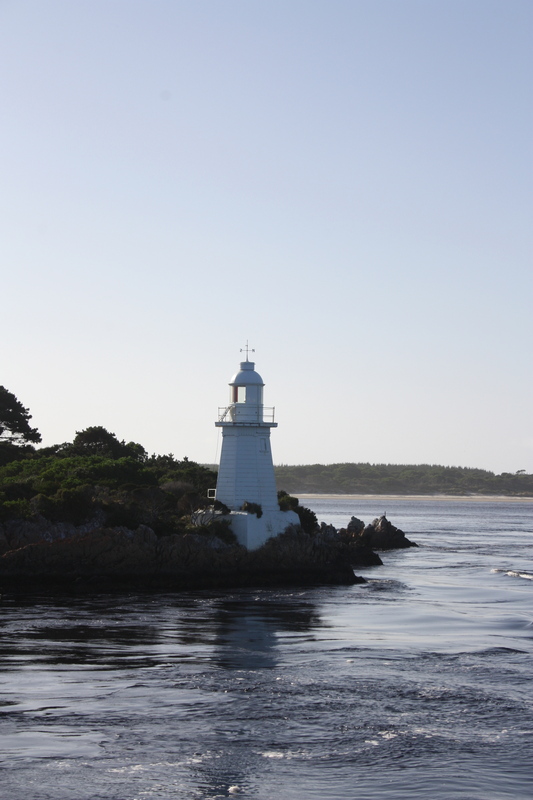 The channel is not very wide in places, reducing to 200m at the entrance which is guarded by a lighthouse on a small rock outcrop so you can see why the port of Strahan has lost it’s use as a port for big ships. Sandbanks galore on the other side so it is no wonder that so many ships came to grief here. 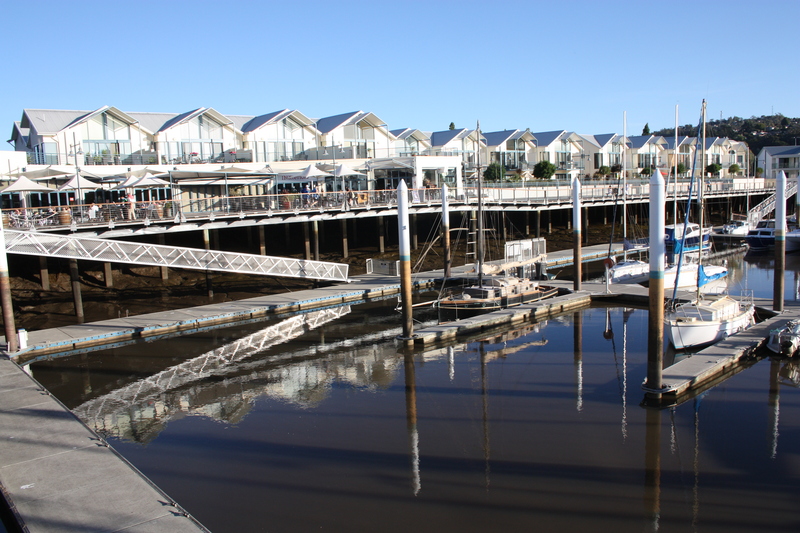 Strahan was a thriving port until the vessels got bigger and thus too big for the port. Heading up river we go past Atlantic Salmon fish farms which have some containers holding in excess of 20,000 fish. There must be over 30 of these containers so you do the maths – it is big business here! Slow down for the Gordon River entrance and cruise gently down viewing, as someone described it as, “fifty shades of greed” in the trees. Very little in the way of water birds here as the river is too deep and most birds like a shallow river. At one point the river is at least 35 meters deep. Stop off at Heritage point for a walk around a wooden walkway just inland. See many types of trees including the Huon Pine which only grows in Tasmania, is very slow growing but very, very resilient and was used in the past for ship building as it does not rot easily. A tree about 80 years old is shown to us that is not much smaller than my wrist. Back on board and although it is yet midday, lunchtime, and a fantastic one at that, salmon to die for as well as salads and cold meats. All packed away by the time we exit from the river as we now head for Sarah Island. 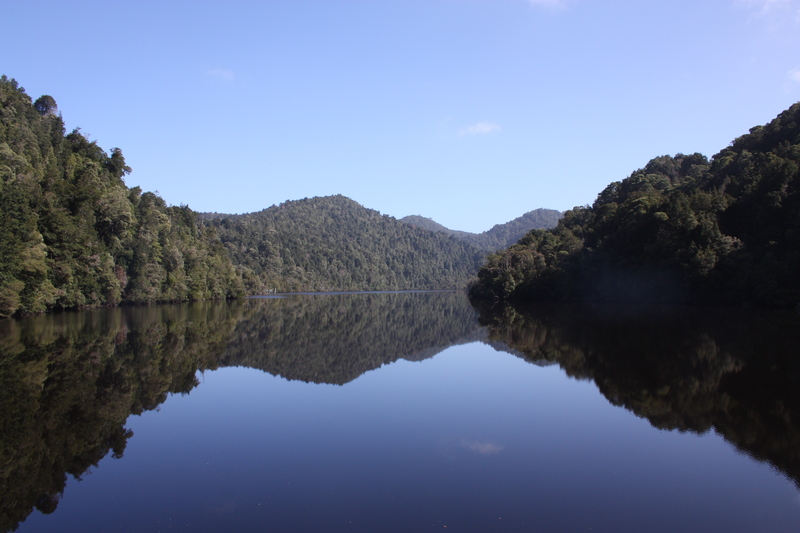 Fancy that, sailing down the Gordon River and landing on Sarah Island! Sarah Island is where many of the 2nd offenders landed and we are given a fantastic tour by, what we learn later, is a travelling actor who occasionally picks on people to play the part of some of the characters. Some parts of some of the buildings are still visible, such as the oven, but many you have to use your imagination. Back to Strahan and we head to the saw mill and information centre. As I thought, the Wilderness Railway only runs once a day, at 9am and from Queenstown which would mean leaving Strahan by road at 7:30 in the morning. We were up early today, another early start would not be appreciated so have to give that one a miss. It is a little strange that they only run from Queenstown, only have one train a day and start so early in the morning. Drive on unmade road to Ocean beach a wonderful sandy beach which was virtually deserted and had lovely big breakers crashing into it and an abundance of shells one of which is now back home. Dinner tonight in Bushman’s bar and cafe. We arrive just before opening time which is just as well as by 6:15 all tables are taken. Good meal (lamb curry and lamb roast followed by a delicious cheesecake) although the Carpenters CD on continuous loop is not something I took to. Fellow guests, Anne & Colin from Hove join us on the look out at the top of the hotel. 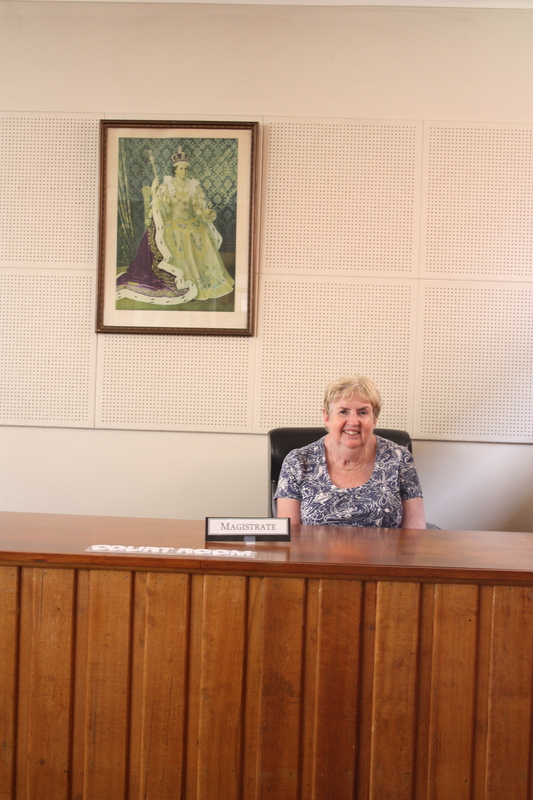 Anne worked as a teacher at Steyning Grammar School, small world. A less sunny day, it rained overnight, so we walk into People’s park after breakfast along a well kept path for 1.2km until we reach Hogarth falls. 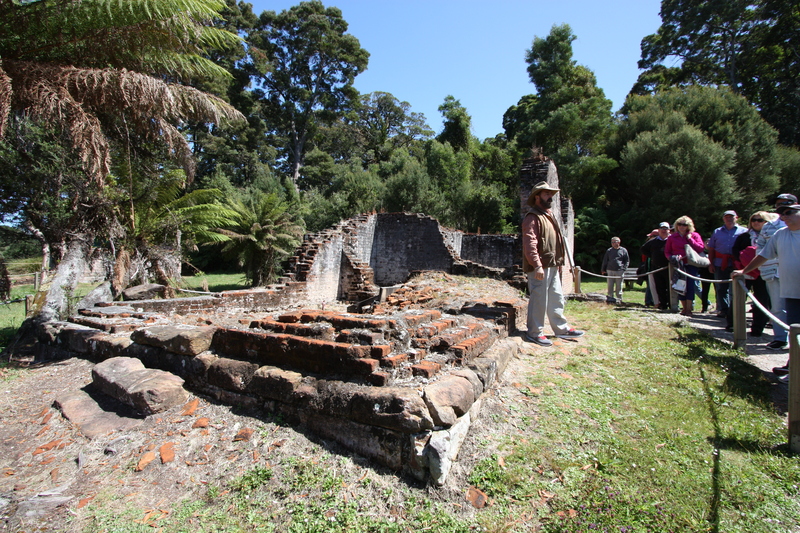 Then onto Cemetary point (some graves are of youngsters, some locals with the name Abel or Tasman) but mostly well tended despite some being very old. Tried to find Lettes Bay but instead found lots of very dilapidated tin shacks – do people really still live here? 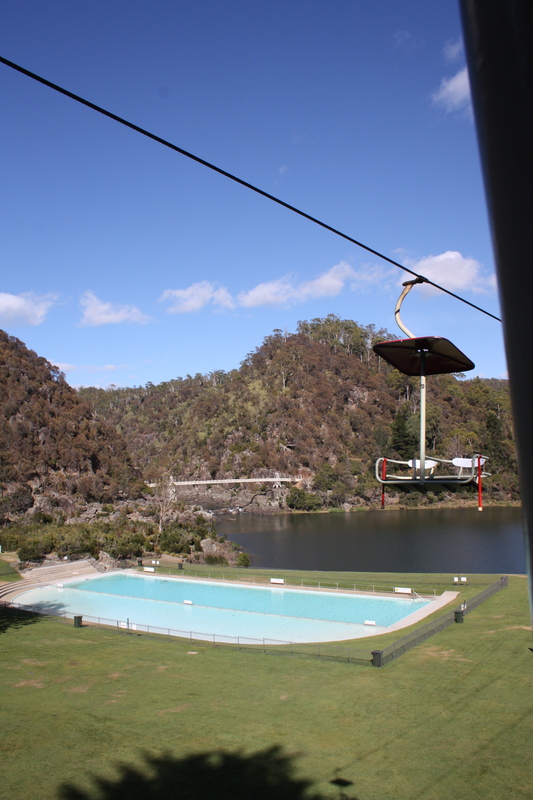 Lunch in town and book up for a jet boat ride tomorrow up the King River. The boat that never was play. 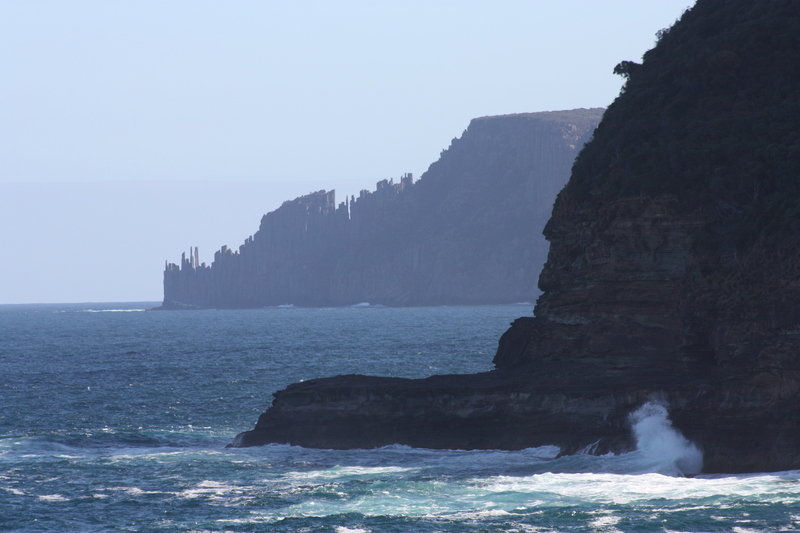 Explore the area around Macquarie Head which is 11km along another gravel road, and back for a rest before venturing out to watch the play, “the boat that never was”. This is a play performed by 2 actors that explores the adventures of the last ship ever to be built on Sarah Island. It was supposed to be sailed to Port Arthur but to cut a long and hilarious story short, it ended up in Chile with no papers so actually was only a bundle of wood held together by rope as it was never registered. 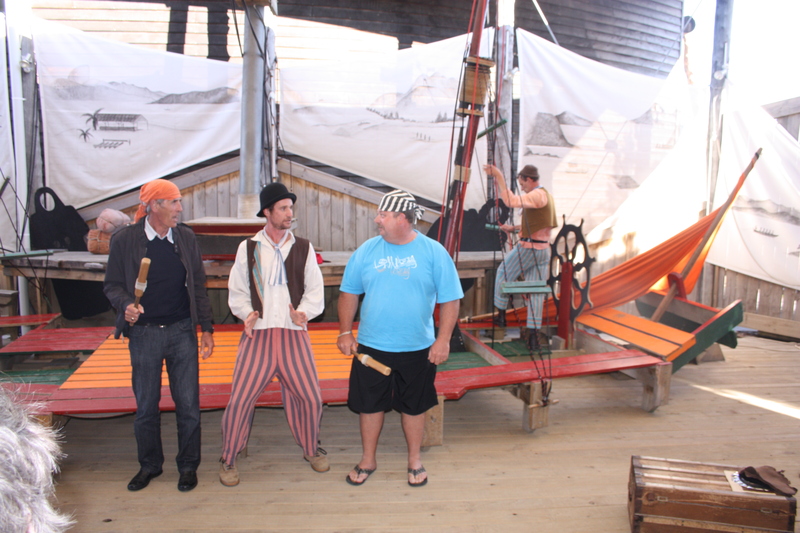 The two actors supplement the story with audience participation, some on stage, some not and the whole show was a scream from beginning to end and well worth the entrance fee. Dinner again in Bushman’s, he recognised us from last night, chatted and knew of the Isle of Man, followed by watching the sun set on the beach outside Ormiston House. 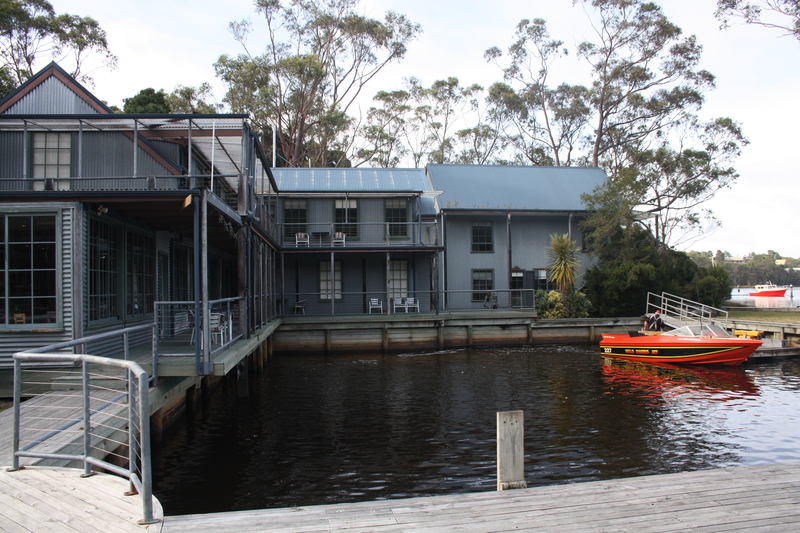 Drive to Cradle Mountain today is scheduled but before that a jet boat ride on Strahan harbour and up the King River. Not as spectacular a jet boat ride as Queenstown NZ but more informative and interesting in history. 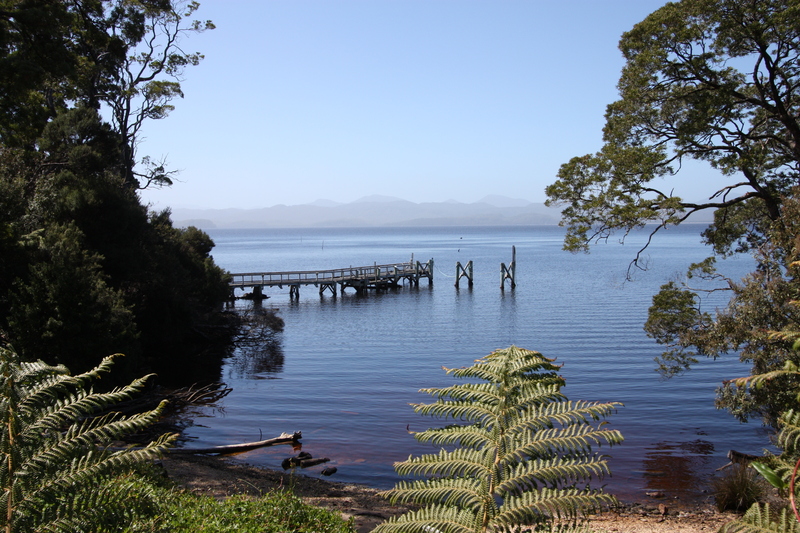 Follow Wilderness West Coast Railway line for most of the way but the reason it is not working fully from Strahan is due to some unsafe bridges and other structures at the Strahan end. More Huon pine trees pointed out and information given about the silting and pollution of the river by the early miners and more recently form the Queenstown mines. Back into Strahan, buy lunch and coffee, get Huan off cuts and Huon honey server, fill up with petrol and off to Zeehan which is another mining town. 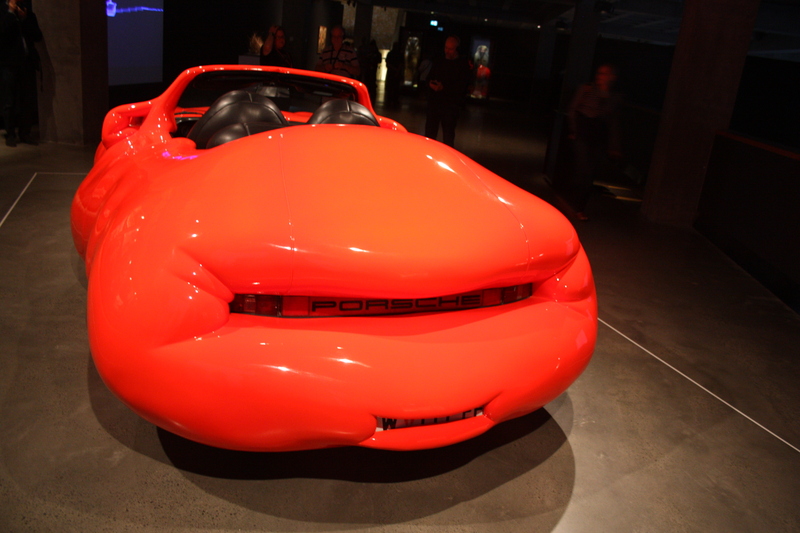 We are told that it has an interesting museum and they are not wrong. A good 90 minutes spent around there and we barely scratched the surface. Old railway engines, lots of old rusting mining equipment but also loads of old photos and a visit to the Gaiety Theatre, old Police station and surprisingly, a Masonic Room. I don’t think this would have meant so much to us had we been here first and not first spent time in Strahan, sailed up the Gordon and King Rivers and had the talk on Sarah Island. Purchase a piece of jade from local store and head off for Tulloh. Unfortunately, it is about 20k into the journey that I realise we have taken the long way around and added probably an hour to the journey. The road we took was virtually deserted although at one point there was a gathering of probably 50 bikers. Eventually we reach the A10 although at the junction, we had to negotiate a complete re surfacing of the road and had to wait for a digger to move some rocks from our intended path! Not one house was passed by the side of the road which probably explains the lack of traffic. A dam for a lake is reached and crossed, the drop on one side being staggeringly deep. Drinks break at Tulloh although it did not have much going for it. 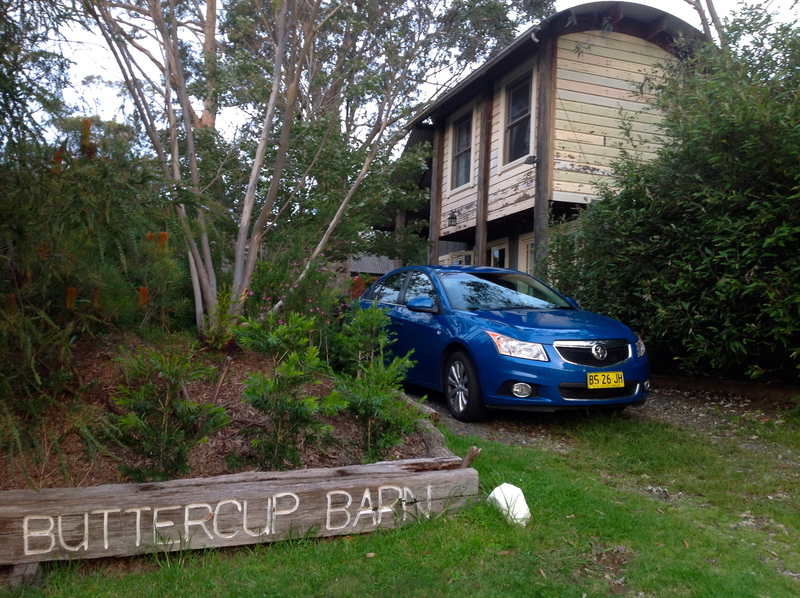 Back past roadworks and onto Cradle Mountain and our stop at the lodge for the night. Loads of wildlife as we expected but so near to us and not afraid of us humans. After dinner in the restaurant, we opt for the hour long evening minibus tour to see animals and we were lucky to get on as spaces are limited, we took the last two places, so booking early is advised. This was preceded by a slide show on what to expect in the way of wildlife in Tasmania which was very well worth going to although I am not sure I remembered all the animals shown! Not expecting much we were inundated with sightings of Bennets Wallabies, Possums and Wombats. 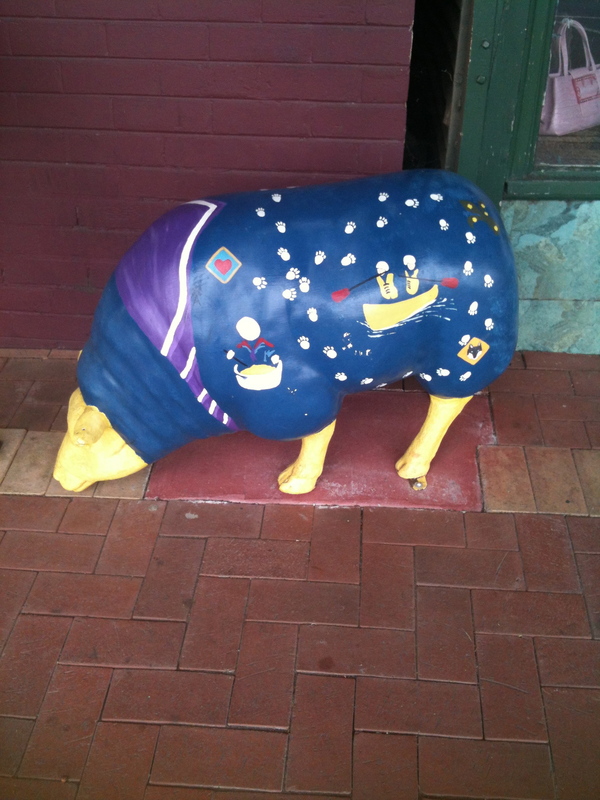 Then on the return, a Tassie Devil. John, our guide told us that he had only seen about five in a year and you could tell by his voice he was really excited about seeing this one as a cancerous disease has wiped out 90% of the wild stock. No Internet access here but a lovely light room with a decent view for a change and a gas wood effect fire although we don’t need it tonight, it is still quite warm. Isn’t it nice to wake up to a view and be able to lie in bed and watch the clouds roll by. The last three hotels were not as inviting, this one is and we are only here for one night! The added bonus is of course the five wallabies grazing outside our window, we don’t even have to get out of bed to see them. Checkout by 10am is a bit early and of course many of the breakfast goodies have gone early as well. Nevertheless, the breakfast is good and we also get a window seat and watch a Platypus swim in the lake. Check out and walk around the 20 minute short walk but no animals around, probably sheltering from the by now heavy drizzle. Think about going into the park and to Dove lake but as the rain and mist was with us, decided to save our money. 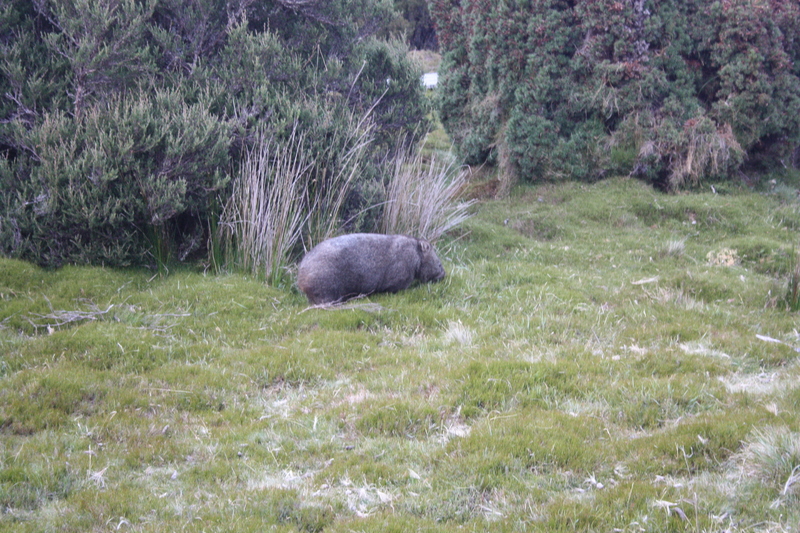 Also missed was the Tasmanian Devil sanctuary, having seen a Devil last night. Definitely a place where you could spend more than one day at. Drive northwards then Eastwards towards Sheffield (population probably under 800) and Launceston. On way, as clouds cleared, we came across an Enchidna by the side of the road and three impressive looking birds but not sure of their names. 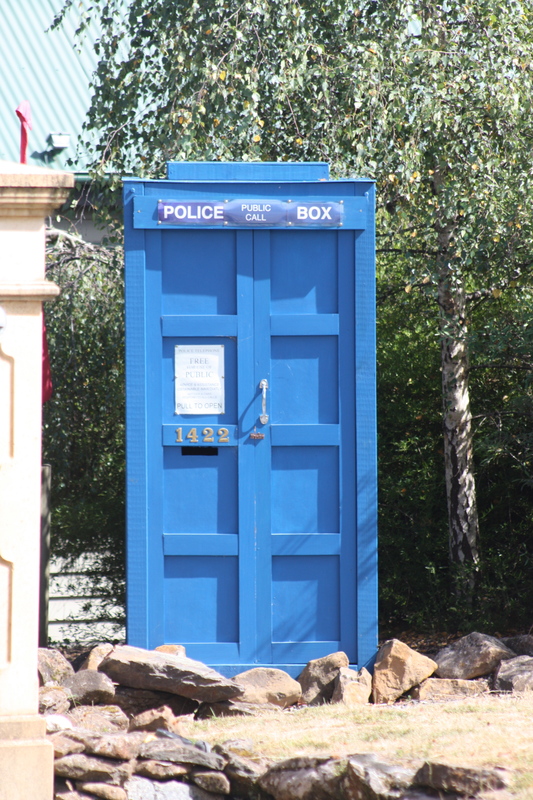 Stopped for lunch at a lovely cafe en route, Round Hill coffee at Cethana after seeing an old fashioned Police Box – has Dr Who been here? Difficulty finding Ashton House as road name had disappeared. 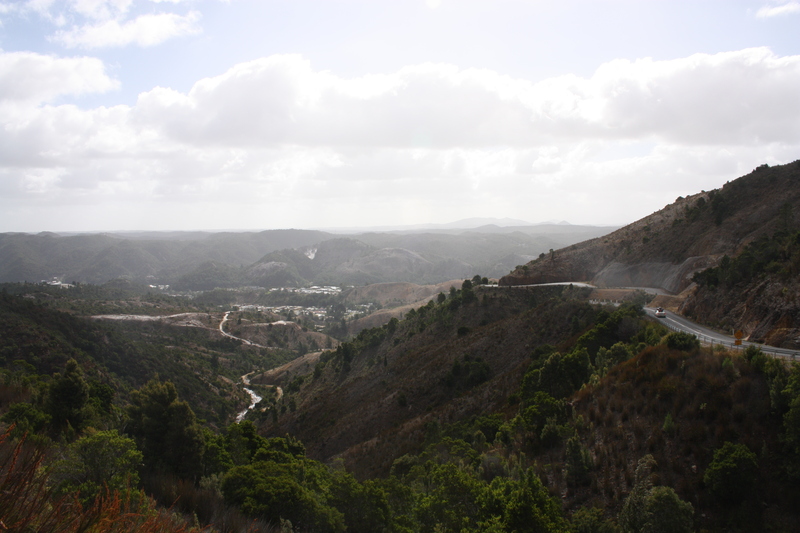 High Street is not what you would think – it is the highest street in town and up a very formidable hill about 1.2km from the town centre. So much for Audley saying it was a short stroll to the shopping centre. A light and airy room with fresh milk provided, bonus. Today is a public holiday in Launceston, ladies day at the races, but finding food was not an issue, eating out at Cateracts where Richard opted for stone cooked steak similar to that encountered in Nelson about a year ago. Some very colourful ladies dresses worn by race goers. News from home: Flic’s injection procedure seems to have gone well albeit she was in pain a bit due to the needle not getting in the right place. Agree to Skype her tomorrow. A clear and sunny day, shorts weather again after a week or so being not so warm. A lovely freshly cooked breakfast for a change and we set off for the gorge, “flying” over on the longest span in the world for a chairlift at a very graceful speed no quicker than walking pace high above the ground. A peacock family awaits us at the other side before we walk to the suspension bridge and then back to walk part of the way down the gorge. 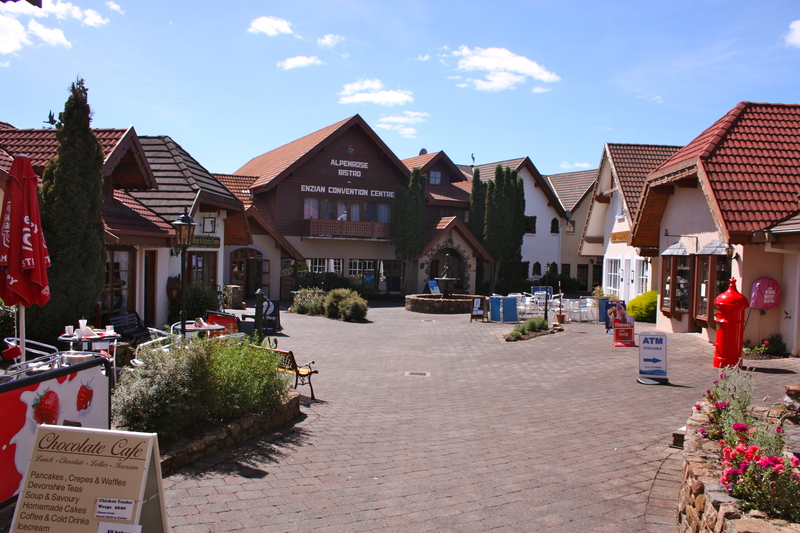 Drive off northwards out of Launceston along the Tamar valley and stop at Grindelwald where houses in a small area are constructed in the Swiss Chalet style after the wife of a wealthy land owner liked what she saw in Switzerland. 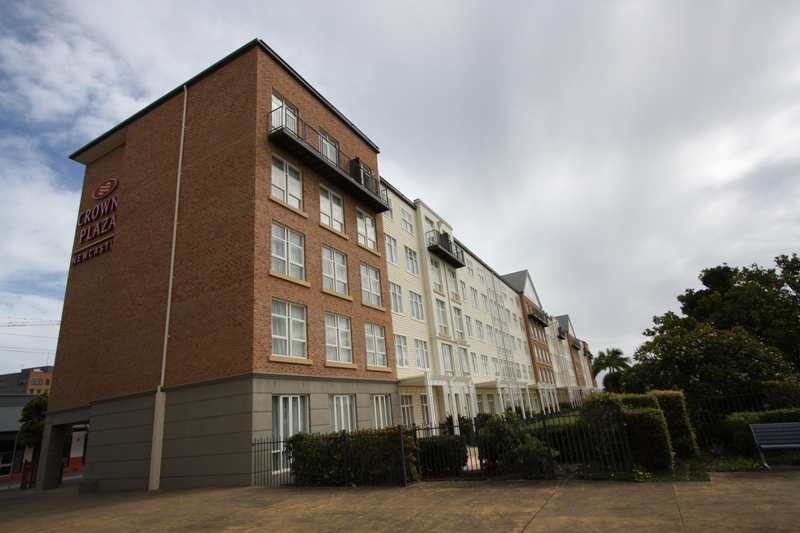 Other housing in the area was of a modern and opulent style. Onwards to Beauty Point which didn’t really attract although for lovers of Sea horses and Platypus it would have been ideal as there are two “museums” dedicated to the preservation of the species. Sal takes over driving and we head back South but this time crossing the Batman bridge and on towards Low Head where the Tamar flows out to the Bass Sea. A nice set of buildings at the head that were a maritime museum but some are now self catering units. It gets very windy here we are told. Back to Launceston and dinner in Levee watching the world go by. 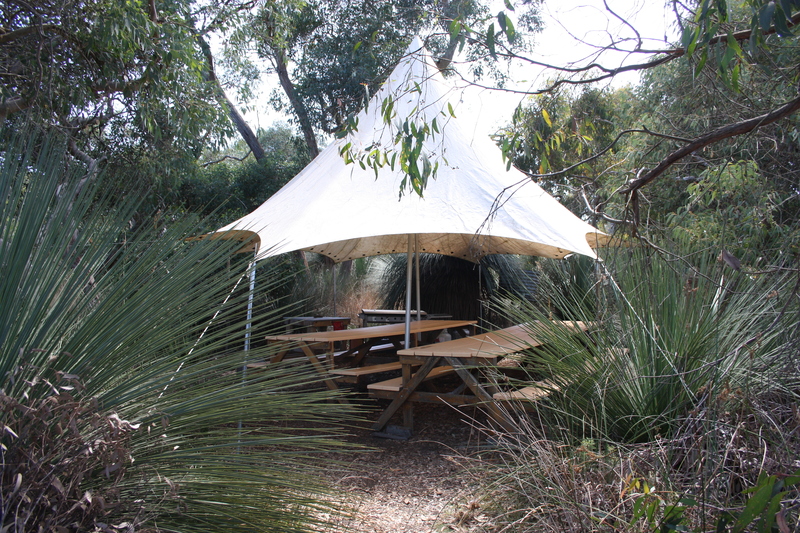 Leave at our check out time of 10am and head for Freycinet following the Midland Highway (A1) south. Only trouble was we must have missed a signpost and ended up on a side road through little villages such as Nile, being slowed whilst a farmer moves his sheep along the road from one field to another and then the sight of a flock of birds resting on the backs of sheep. Yet another non tarmacademed road for about 5k until we eventually reach the A1 and our intended journey. Stop at Campbell Town which although not much more than a one street town does possess an interestingly inexpensive antiques shop. Stop also for an ice cream just before the Coles Road, good value at $4 then onto the Freycinet national Park where entrance fee is A$48 for two days. Lodge room well equipped with a balcony but unfortunately not a sunset or sea view and no Internet connection. Laundry done though and we head off for a stroll along Muirs Beach in and out of the shallow warm water. Fish and chips for dinner at a local take-away and a yogurt from the local supermarket – we do know how to eat well! Evening drive out underneath The Hazards and then up to Cape Tourville lighthouse and a look South West to Wineglass Bay – our destination tomorrow – and Lemon Rock. Room not exactly as clean as it could be, dust behind bedside cabinet, on bedside clock radio on mirror which was not appreciated from a top class establishment, reported the following morning. Officially, summer is over but the weather takes no notice and we have yet more sunny weather. 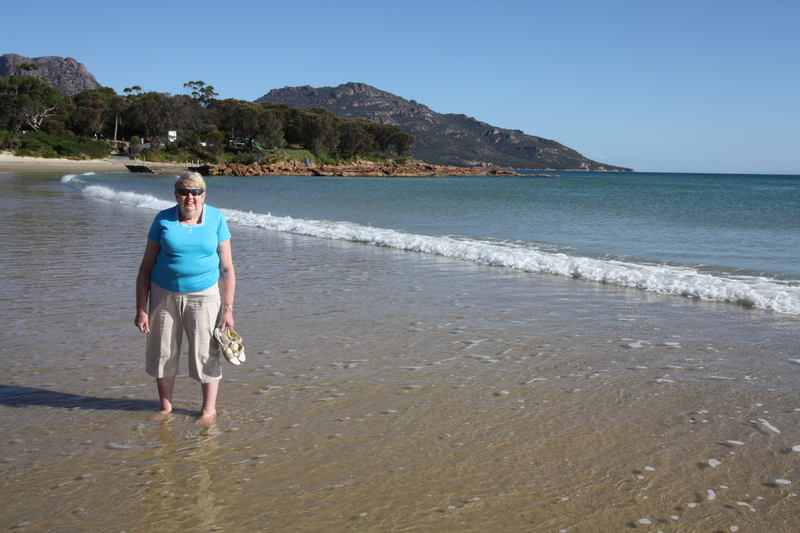 After a breakfast in the hotel which whilst being OK, is not as good as the freshly cooked one at Launceston, we head off for the jetty for our boat ride to Wineglass Bay, voted by a US magazine as one of the best beaches in the world. Boat only holds 45 or so, we are supposed to arrive at 09:45 and there is a party of probably over 30 when we get there at 09:30 so wonder if we will get seats together. We do manage it but soon get up and spend rest of outward journey on deck at the front, viewing the pink granite, the old mine workings, the wildlife, including dolphins, fur seals and the odd Gannet or two but no penguins. Sumptuous lunch with local cheese, quince spread, apple juice and sparkling wine whilst we viewed the magnificance that is Wineglass Bay. 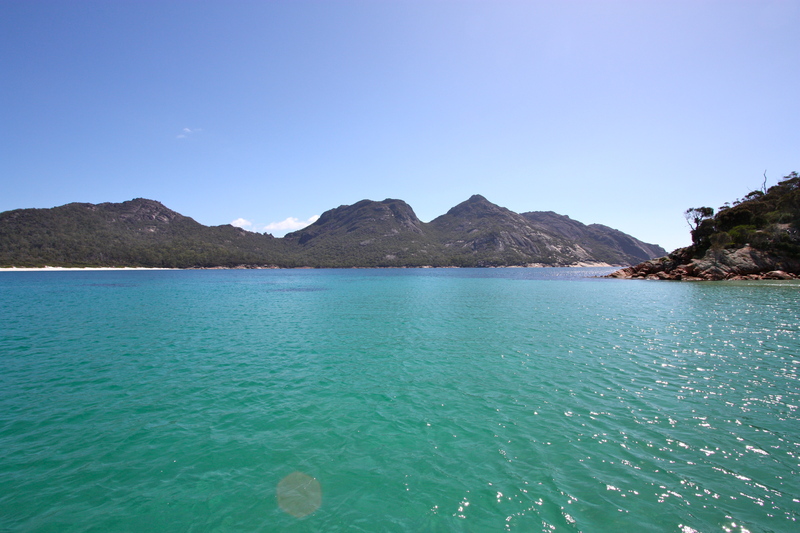 You can only reach Wineglass Bay by boat or a 5 hour trek over the hills from the Freycinet lodge area and that was just not going to happen for us. 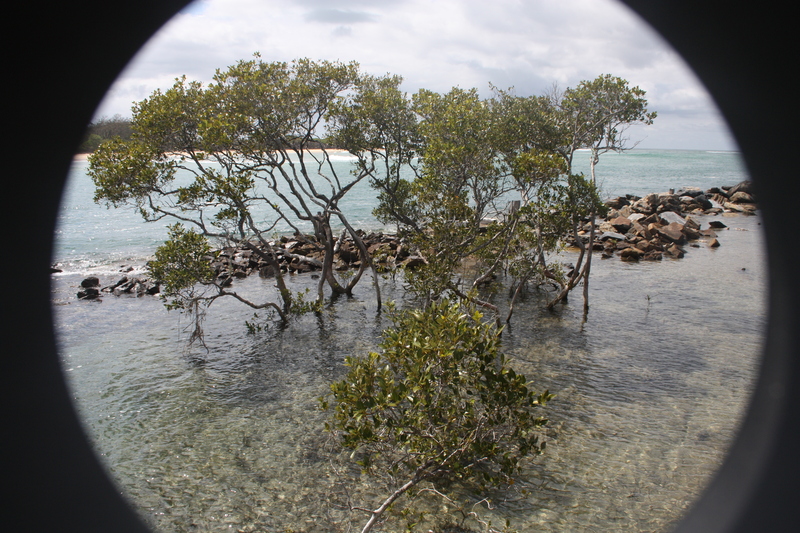 It is indeed a magnificent bay with a couple of small inlets off the main bay that are even more sheltered. The vessel, soon to be replaced with a larger one, has it’s resident dog that barks and scampers around at the sight of dolphins which in some respects was annoying. 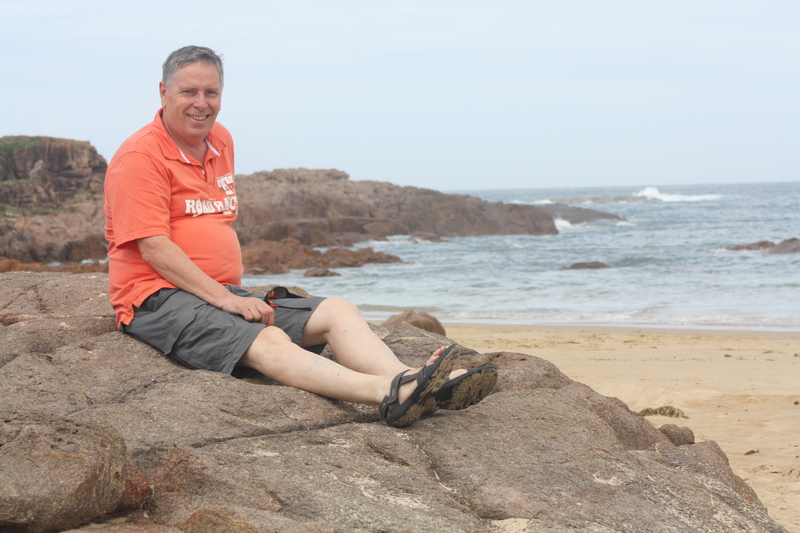 Back to hotel and a rest before venturing out again to Bicheno for a pizza and then a penguin tour. Room still dirty (reported on leaving the following way). No cameras allowed on the tour and unfortunately not too many penguins and those that we saw were not minded to move too much although the babies were more mobile. Sadly no penguins moving up the beach but we did see one in a garden opposite the drive down to the sanctuary. 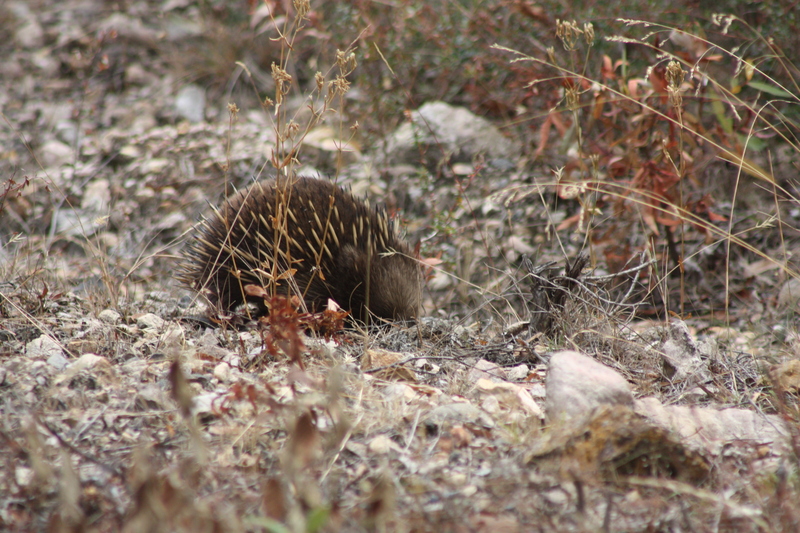 Drive home slowly and manage to avoid at least three animals on the 40k drive back to Freycinet lodge including possibly a Tassie Devil slough it could have been a small ferel cat. 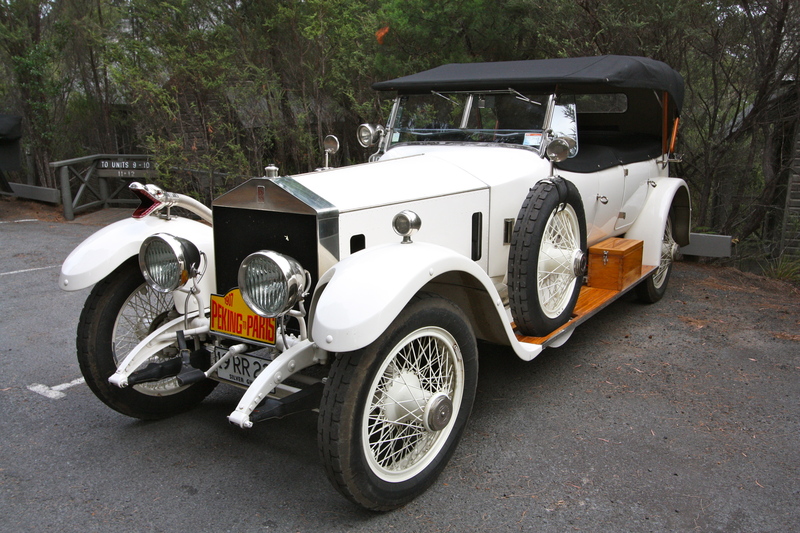 Hotel is hosting a vintage Rolls Royce rally with, what we learnt was about 15 of them in attendance, wonderful machines one from as far away as Florida. A cloudy day to start and after breakfast and a further look at the Rolls Royce cars, drive off to Port Arthur which is not 110 km as advised, more like 110 miles which delays us along with the vast numbers of road works including one where the road has been completely demolished and we travel for about a km on gravel. Along the way we pass over “Break me Neck” hill and “Bust me gall” hill. Where do they think up these names? Clouds now gone and temperatures have risen, so the new sunglasses come in very useful. Buy food from a supermarket for lunch and stop for a late lunch in Lewisham, most unlike the inner city one in the UK that we went to regularly some 28 years ago as this one overlooks the sea! 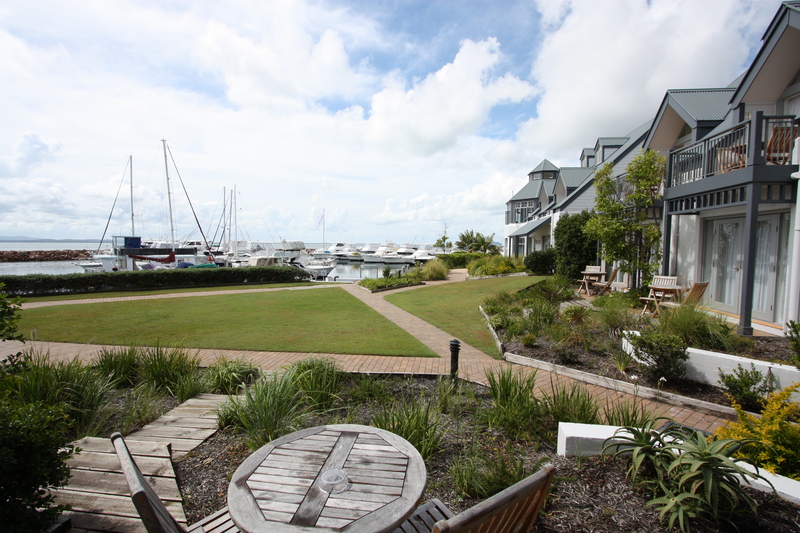 Check-in at the Port Arthur accommodation at about 4pm and go off to explore area. Start by looking at entrance to Port Arthur but as it is now half four decide it is not worthwhile just for half an hour as they close at 5pm (although our ticket would have allowed us to visit tomorrow, we have to get back to the airport at least an hour before Audley advised us) so head south towards Remarkable Cave and Moingon Bay – some wonderful sights with waves crashing down into the caves. It would of course have been better at high tide but another day here would have allowed this. 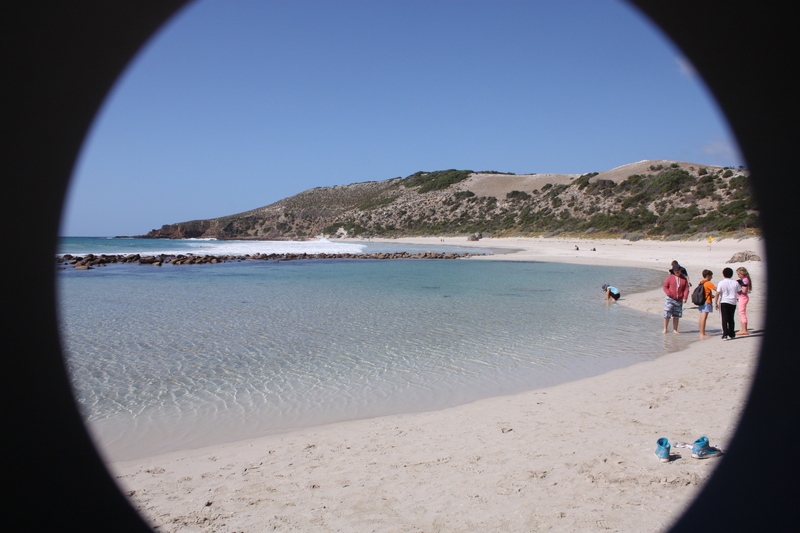 Stop at sandy beach for a walk on the squeaky sand then on to Maingon Bay and Remarkable Cave. Some stunning views out to Cape Raoul over the breakers from the top and a view under the cave from below where some girls were obviously enjoying themselves jumping down from the walkway to the sand below. Dinner in Stewart’s Bay Lodge restaurant after buying Internet access for A$5 for an hour and then find out that we did have a ticket for Port Arthur, a historical site although this was not really made clear to us in the literature so we didn’t have an opportunity to take advantage of it, there being not enough time left in the day when we arrived. Cabin comfortable and warmed up quickly with the electric heaters but settee is a bed settee so not overly comfortable at all. Watch TV for the first time in a week and find Rake which is better than we had first experienced when in Sydney. A cloudy day to start with again and we head out before 10 to go to see the natural sights around Eaglehawk Neck but first the Blowhole and lookout. 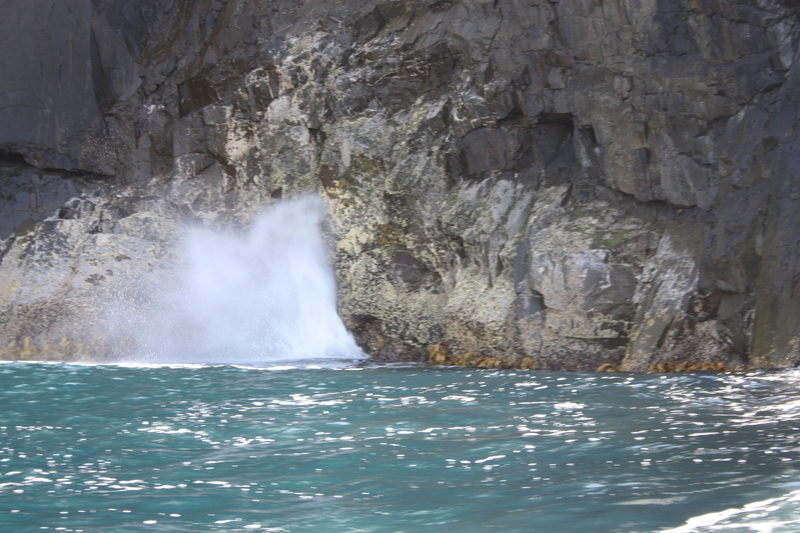 Not as good as the blowhole at Bruny Island but you do have to be tide dependent to see it in it’s majesty. It is likely that storms will cut a hole all the way though the lookout in years to come making part of it an island. 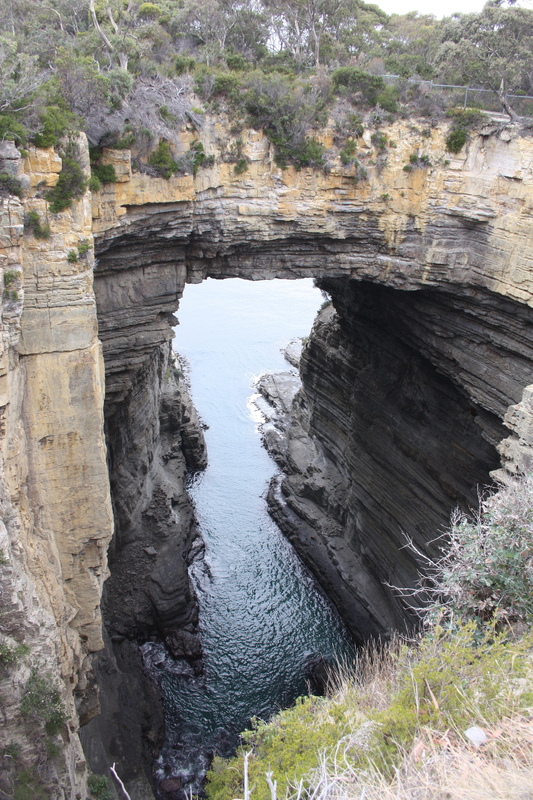 Now on to the Tasman Arch and Devil’s kitchen, both fashioned out of the rock by the weather. The Arch is a fantastic sight, possibly some 100 ft high and 80 feet wide. Not so impressed by the views of the Devil’s kitchen but maybe it would have been better had we walked up to the higher observation point. We pass through the settlement of DOO. 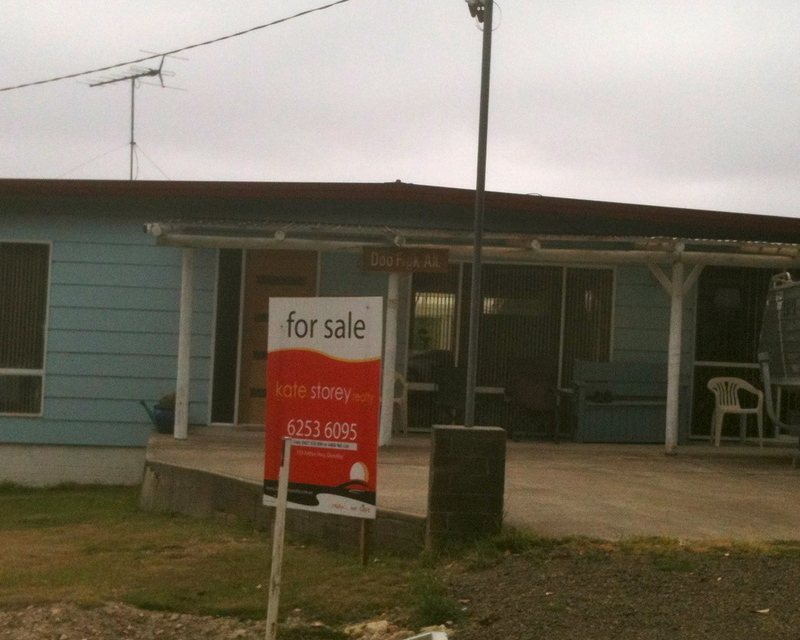 Many of the houses have house names reflecting the name, it is just Aussie humour. More rolls for lunch, eat on an old road adjacent to the new road bridge to the airport, quick view of Cambridge, not worth it, drop car off and back for flight to Melbourne. Audley had advised 20 minutes between dropping off the car and taking off for Melbourne – totally unrealistic so drop car off about an hour earlier thus not being able to go to Richmond or the Port Arthur complex. You can take water through security here which is annoying as Sally just threw her water away. Flight not full but there are 6 more flights today to Melbourne and a JetStar flight left at the same time. George meets us at the airport, unusually airside and we collect luggage and catch bus to Frankston which takes us through the southern suburbs of Melbourne, along the long coast of Melbourne harbour, passing a few local trams and mingling with the city’s exiting rush hour traffic before we get off an hour and a half later, locate George’s car in the underground shopping car park and back to Seaford where we meet Barbara who has made a lovely Roast Beef dinner, very English. Retire late just before midnight. 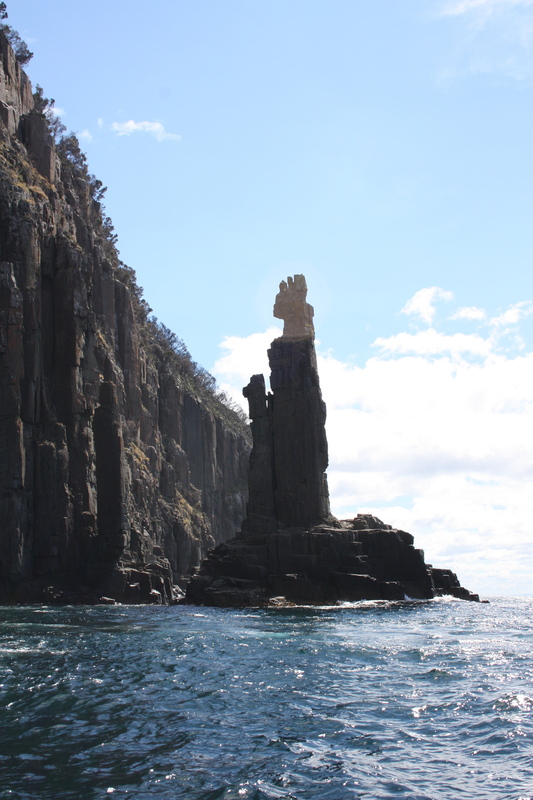 Tasmania was a wonderful experience and there are several parts that we need to return to at some stage, a bit like parts of New Zealand, a bit like parts of the Isle of Man but definitely Australian.